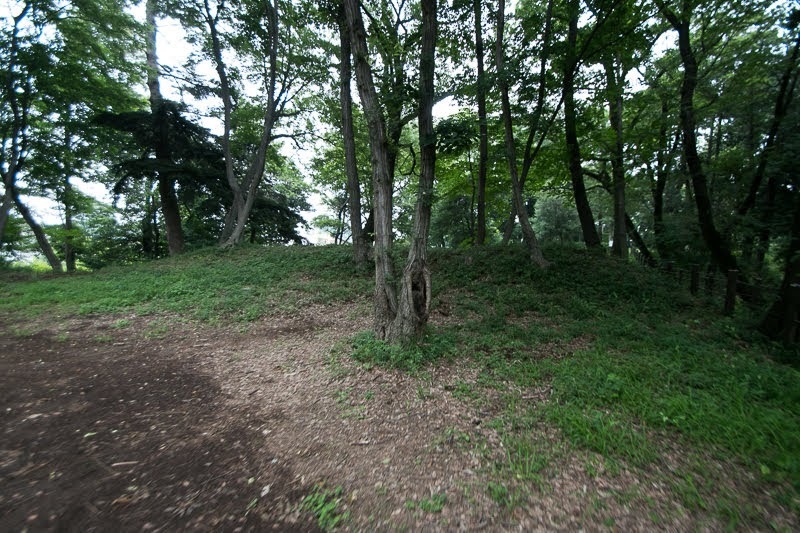 Shakujii castle (石神井城) is built over a plateau of about 20 meter height at the south of Sanpoji pond in the eastern half of current Shakujii-Koen park at Nerima Ward. 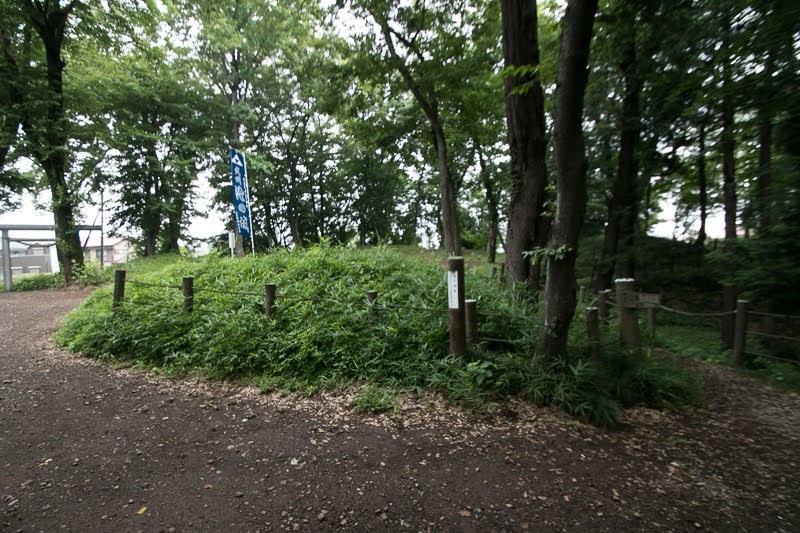 Castle hill is a peninsular like ground between Sanpoji-ike pond and Shakujii-gawa river, which runs the center of Musashino Plateau toward from Fujimi pond toward Arakawa-river. 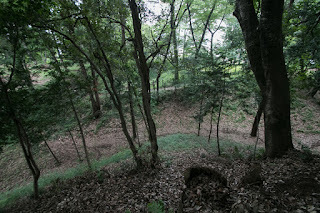 Before the construction of water lines in Edo era, top of Murashino plateau was a barren area because of the shortage of water. 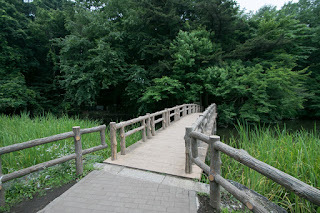 But there are several rivers flows from natural water sources such as Kanda-gawa river from Inokashira-ike pond, Meguro-gawa river from Benten-ike pond and Shakujii-gawa river from Fujimi-ike pond and Sanpoji-ike pond. 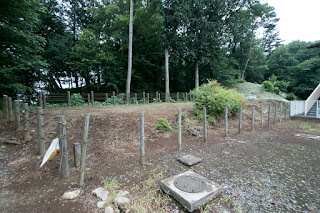 In the medieval era which focused on rice cultivation, the seizure of water source was a critical matter to local lord, especially on the top of plateau which directly affected the income of the land. 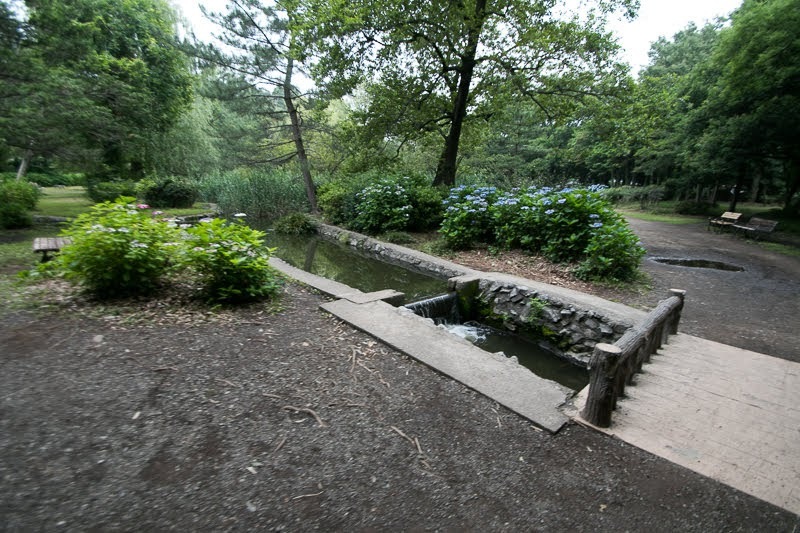 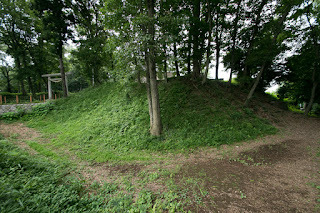 Medieval castles at the next of the pond or the inside of the valley were built not only to protect itself by water, but also to manage the water source. 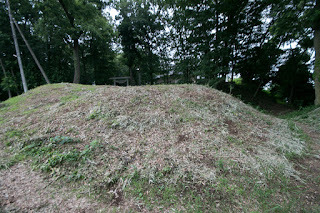 Shakujii-castle was a typical example of such castles. 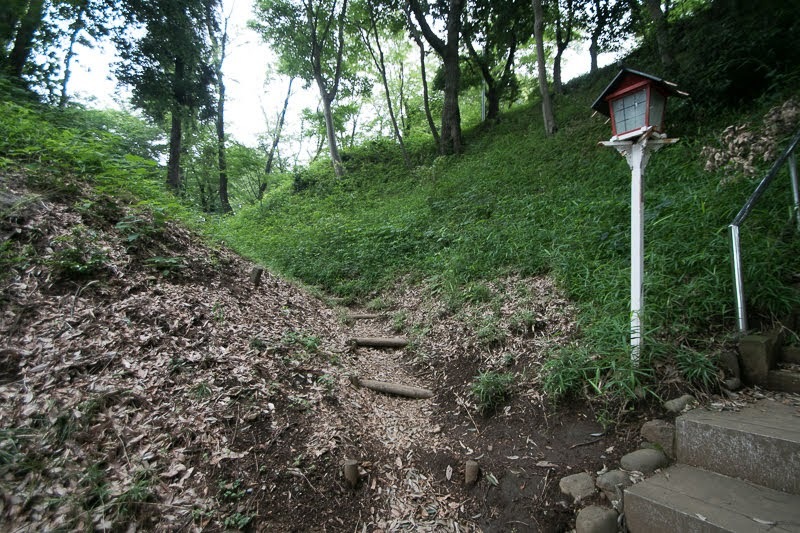 Shakujii castle was built by local lord Toshima clan at the end of 14th century. Toshima clan was originally a family of Chichibu clan, one of major families of Taira clan reigned current Chichibu mountains of Saitama prefecture. 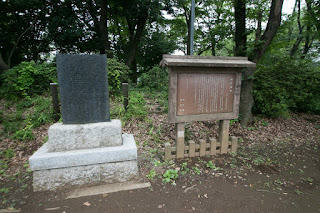 One family of Chichibu clan achieved the manor of current Kita-ward of Tokyo Metropolis thus named as Toshima clan. 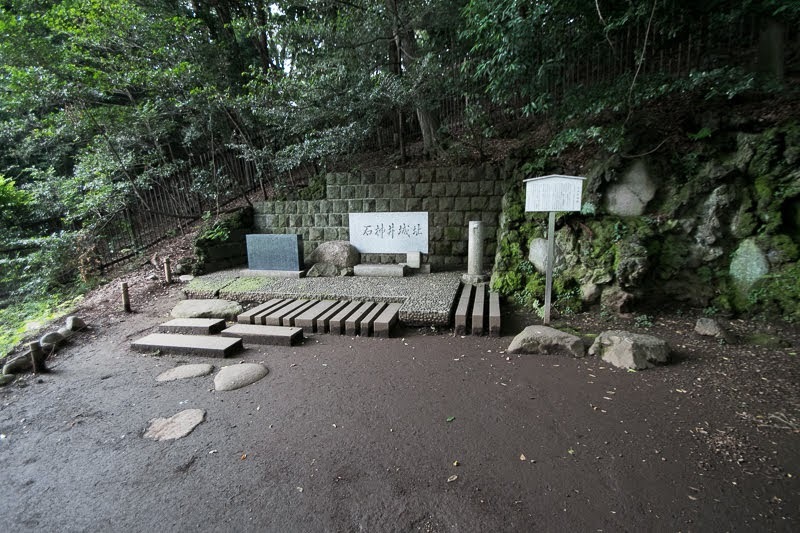 At the foundation of Kamakura Shogunate, Toshima clan belonged to Yoritomo Minamoto (1147-1199), the founder of Shogunate at the early stage of rise, thus became a direct retainer of Shogunate. 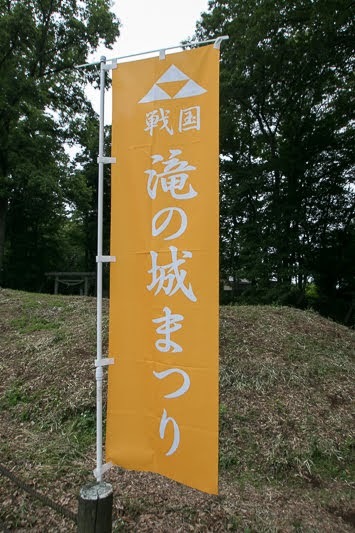 Later Kasai clan, a branch family of Toshima clan which located at current Kasai area of Koto ward, was nominated as a supervisor of Tohoku region and moved to there. 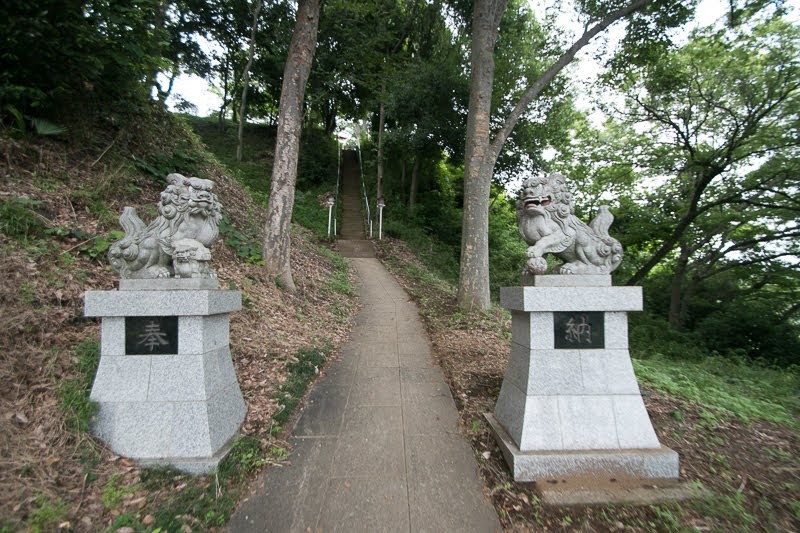 Toshima clan was involved in several battles such as the battle of Jokyu, rise of Emperor Godaigo (1288-1339) and fall of Kamakura Shogunate, or battles between the South Court, Muromachi Shogunate and former retainers of Kamakura Shogunate. 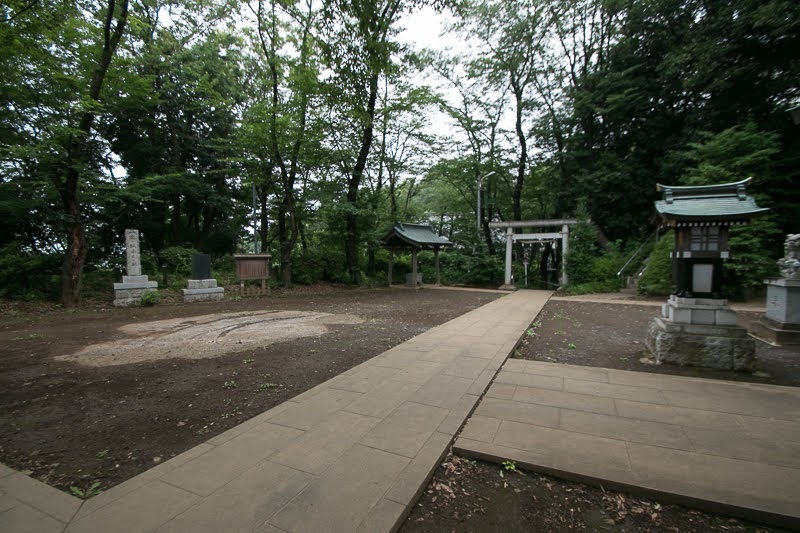 Losing many people in long time conflict but Toshima clan survived turbulent period and became local lord under Muromachi Shogunate. 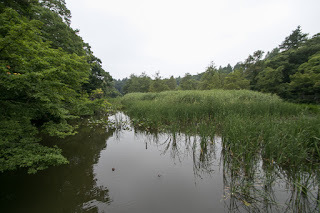 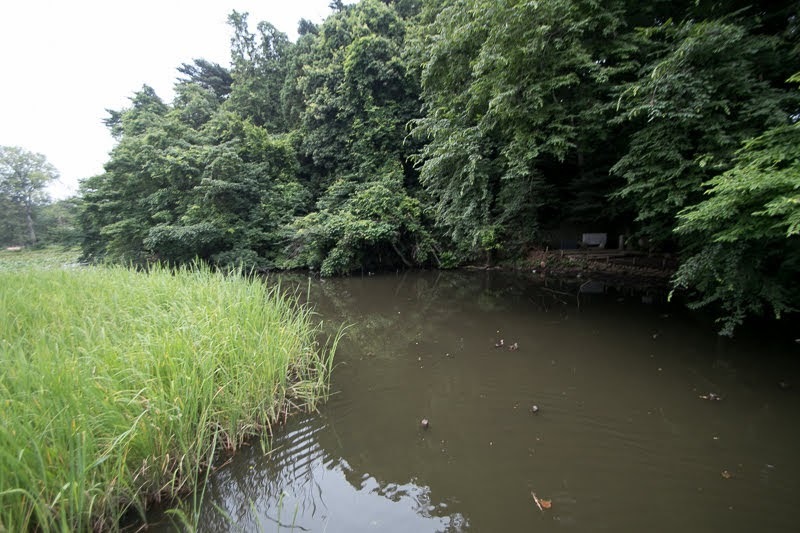 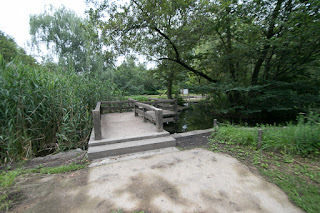 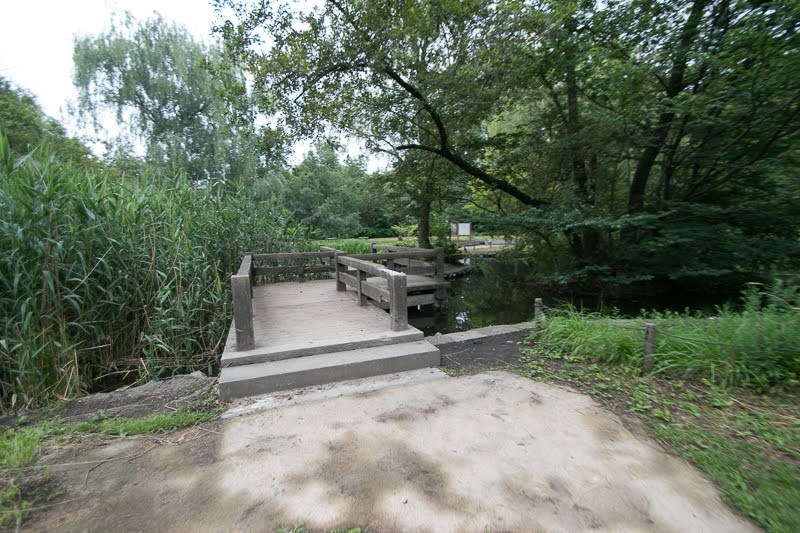 Once the situation had stabilized, Toshima clan started the development of inland area Musashino Plateau thus moved its main base to the upstream of Shakujii river, to seize the water source. 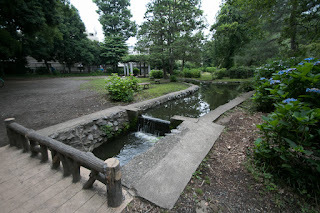 Shakujii river has a plenty water which was later used as a source of paper mills, and has many tributaries which enabled larger size development. 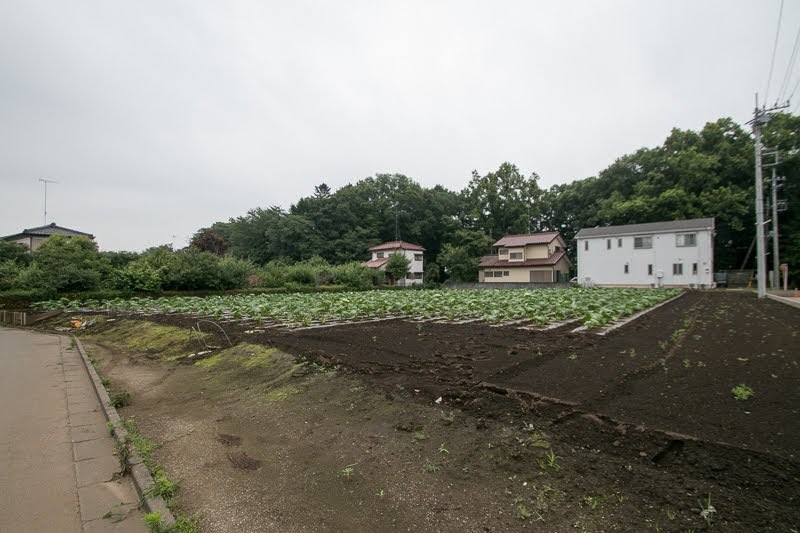 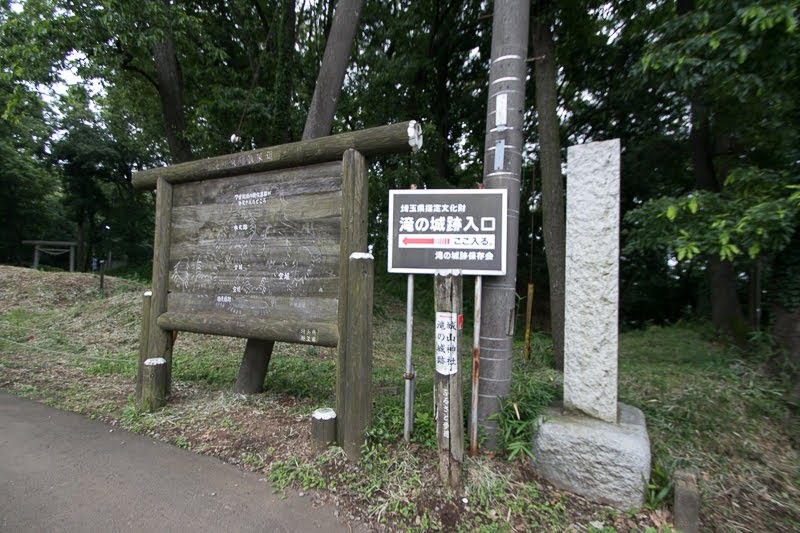 Along with the development of plateau, Toshima clan placed their relatives around the triangle area surrounded by current Arakawa river, Shakujii-gawa river and Shirako-gawa river. 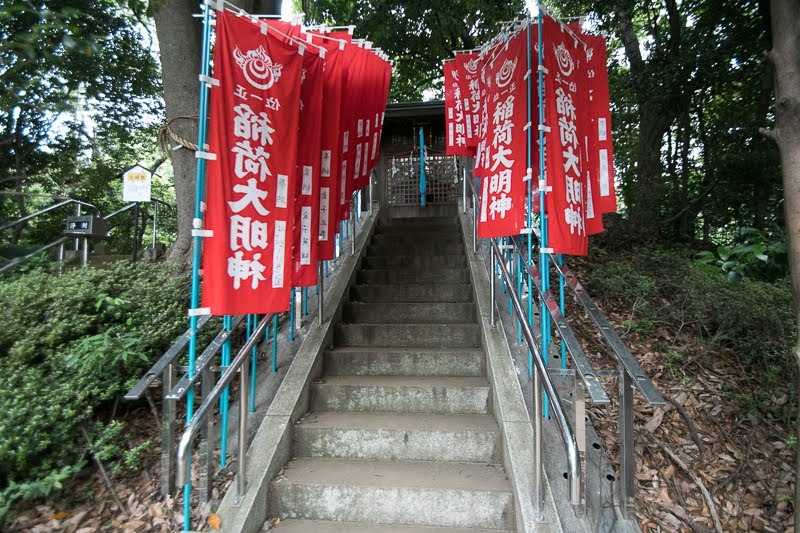 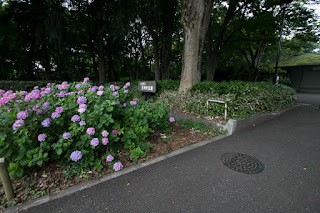 These branch families left their name as place names of towns of this area, such as Nerima, Shimura, Itabashi or Takinogawa, and shows Toshima clan was the origin of the north half of Tokyo area. 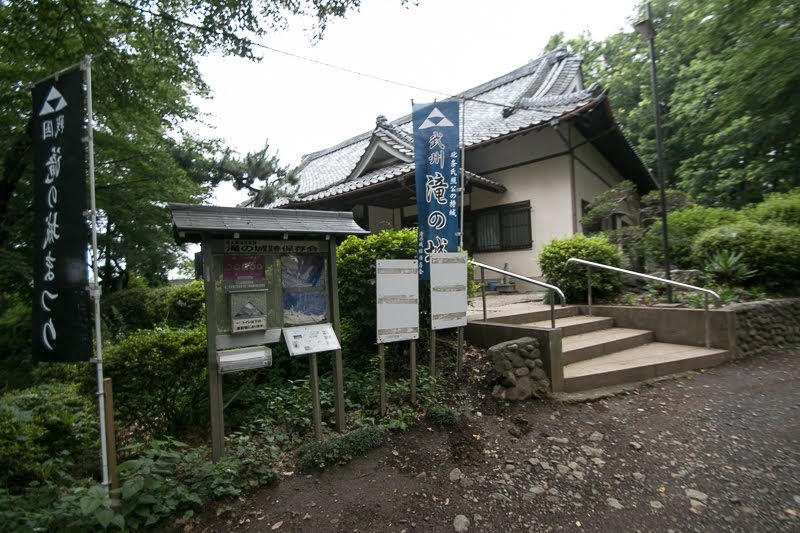 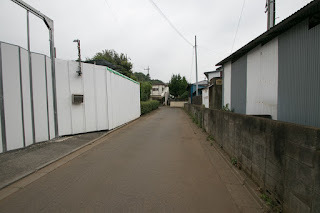 Furthermore, Toshima clan contributed cultural development of area. 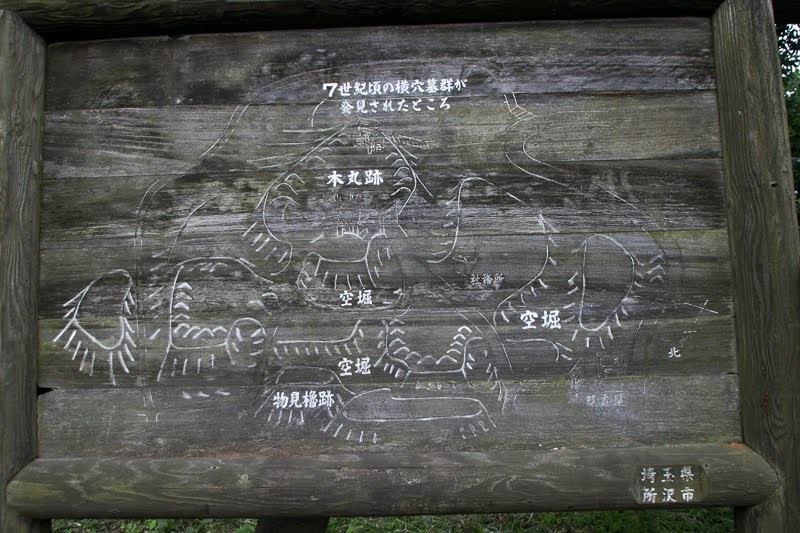 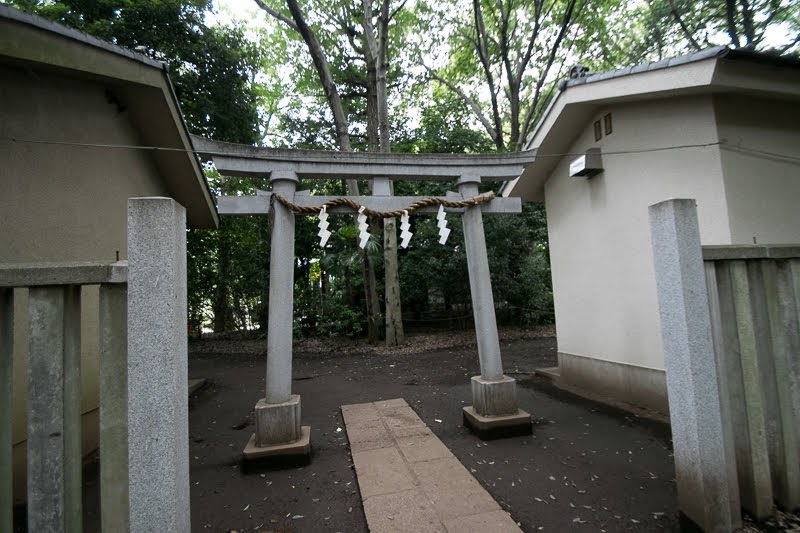 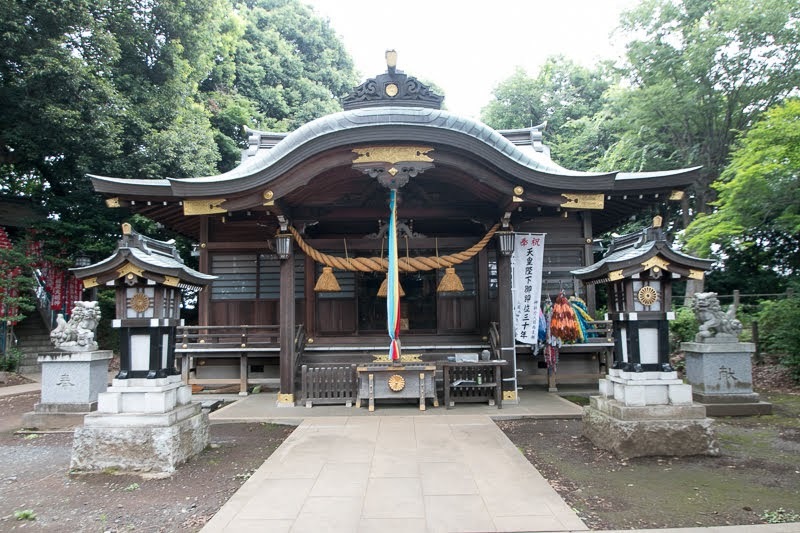 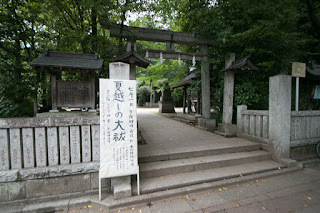 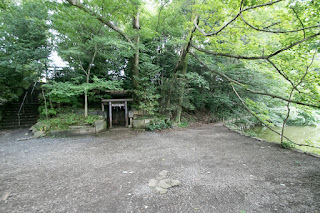 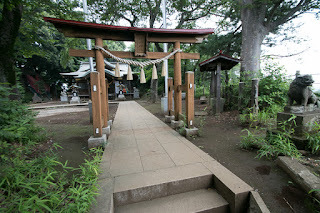 As once Toshima clan became a magistrate of Kumano area of Kii province (Wakayama prefecture), they invited Kumano Shrine, the major shrine of Kumano area, to their territory as current Oji Shrine which keeps Oji Dengaku, a dance devoted to the god. 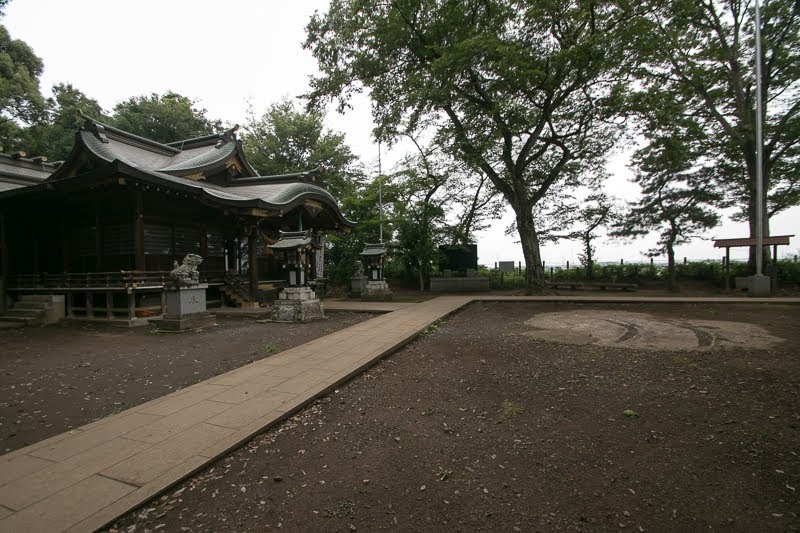 Also there are many temples around the area later regarded as Toshima 88 temples, and some of them were built under Toshima clan. 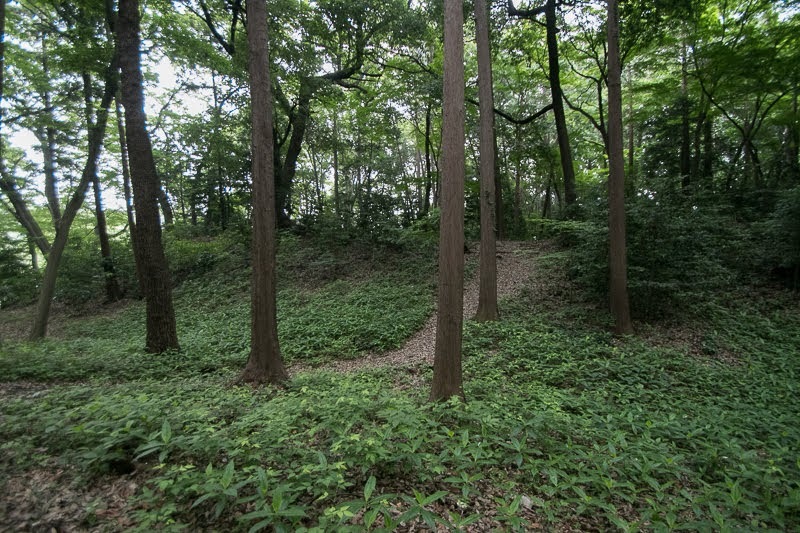 By the middle of 15th century Toshima clan grew to the major local lord of Musashino Plateau, centered on Shakujii castle and Nerima castle, the one located at the place of Toshimaen park. Shakujii castle was also expanded along with the growth of Toshima clan. 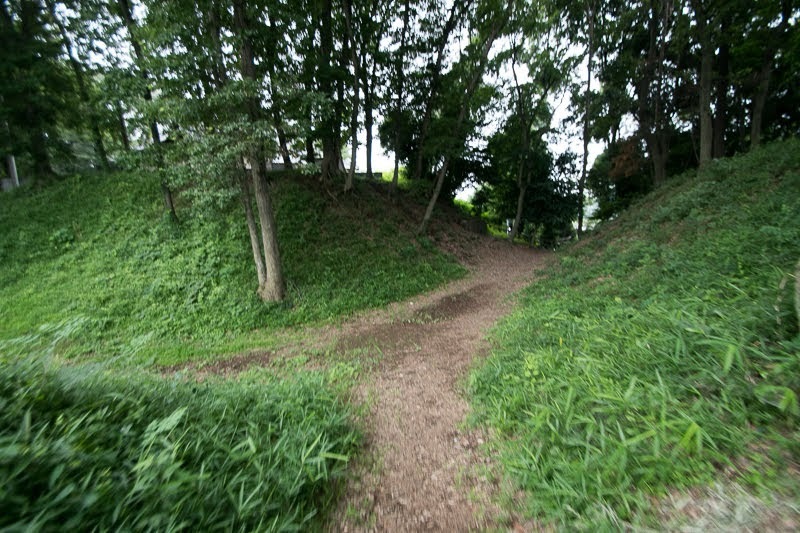 Shakujii castle was built utilizing a peninsular like long and narrow plateau between main stream of Shakujii-gawa river and Sanpoji-ike pond. Unlike other castles built at the tip of the plateau, Shakujii castle is built at the middle of the plateau, to seize the spout of Sanpoji-ike to control the water flow from the pond. 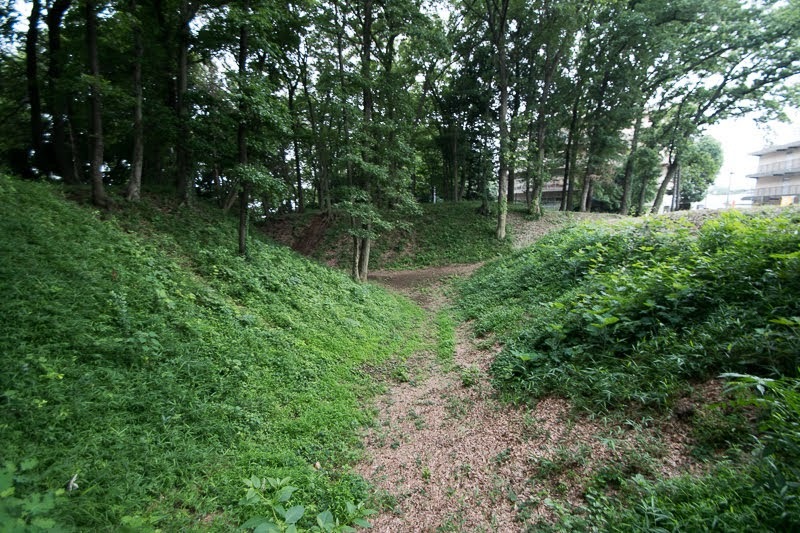 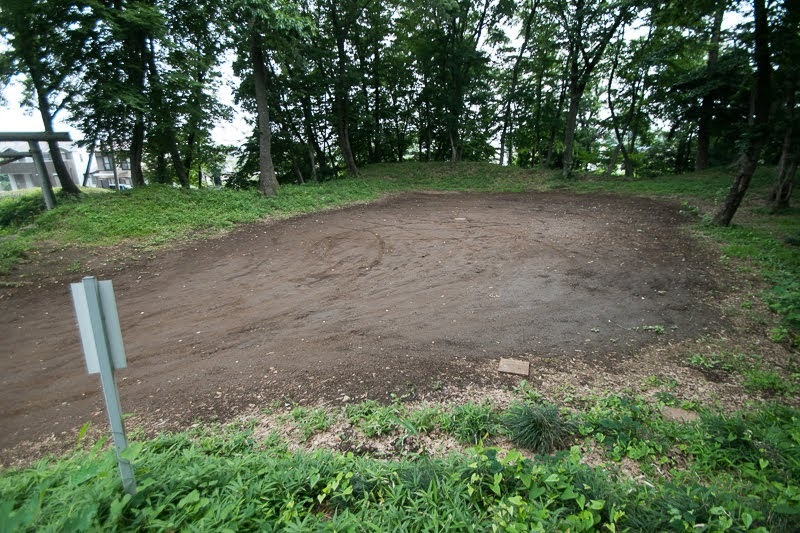 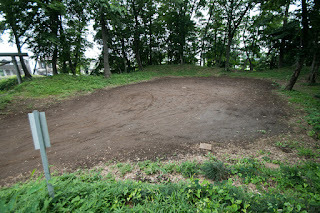 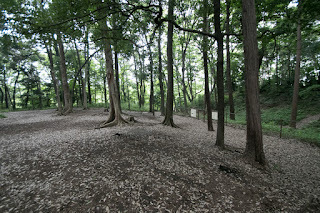 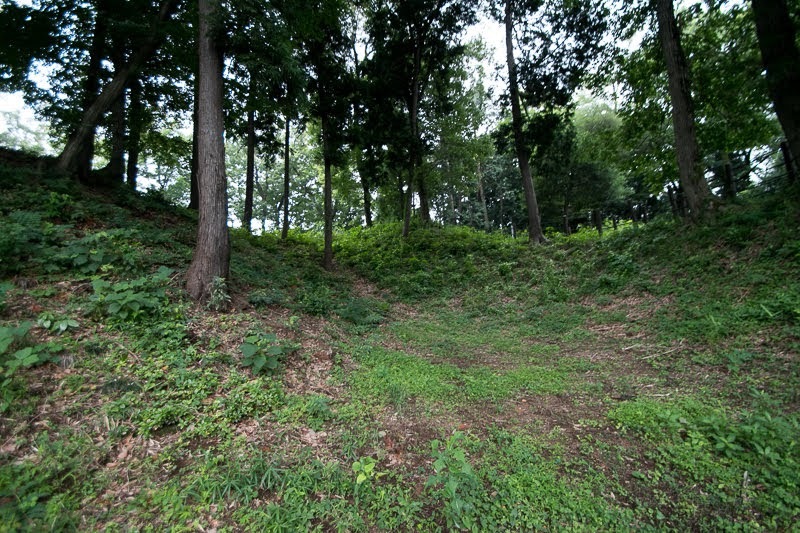 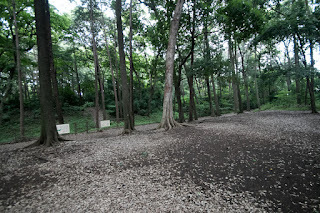 Central area of Shakujii castle is roughly square shaped one of about 80 meter long. 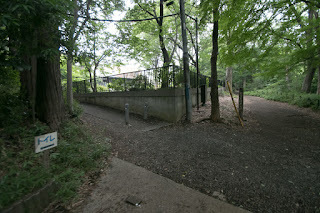 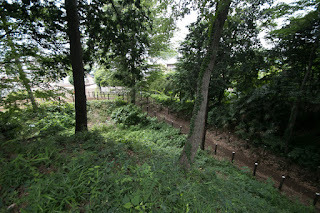 Now entrance to this part is limited but clay wall and dry moat of western line is well seen from outside of the fence. 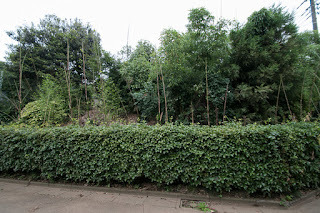 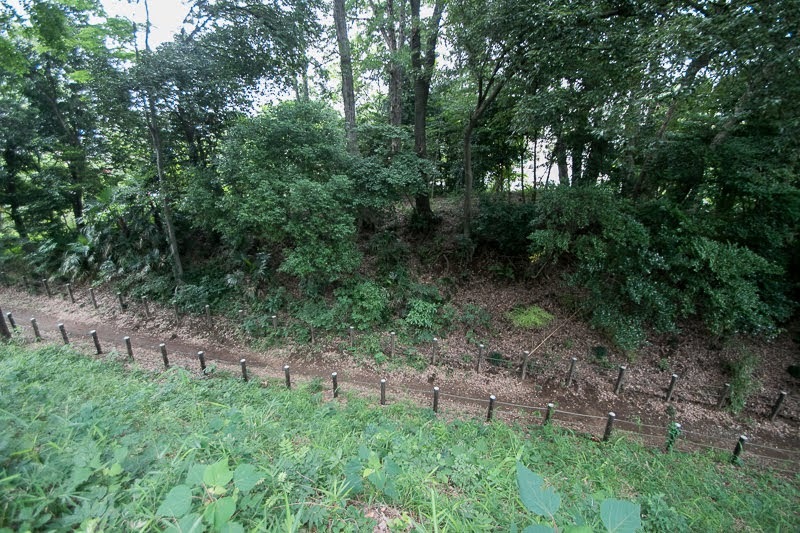 This line of clay wall is folded but it is not clear whether it is an artificial one to protect the entrance or just a shape of original terrain. 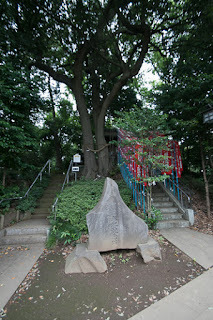 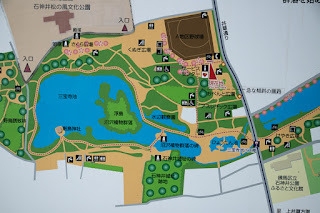 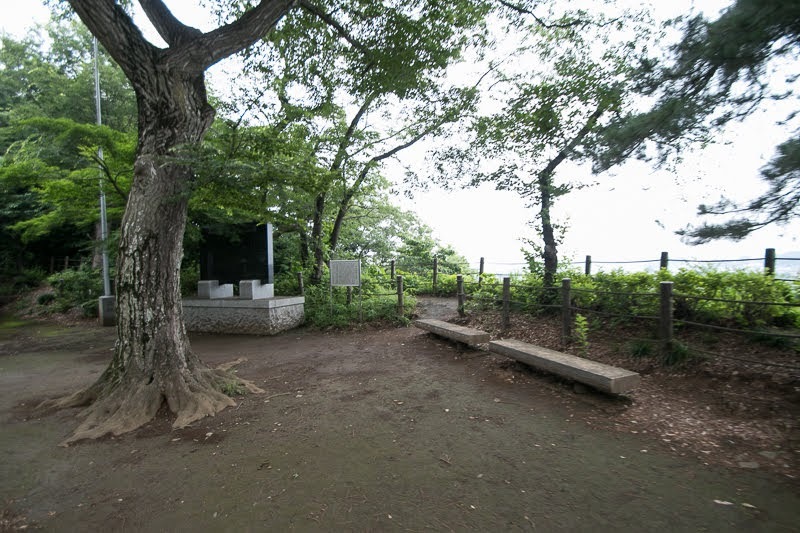 Central area is surrounded by Hikawa-Jinja Shrine at west, Sanpoji Temple at south and Dojoji temple at southwest. 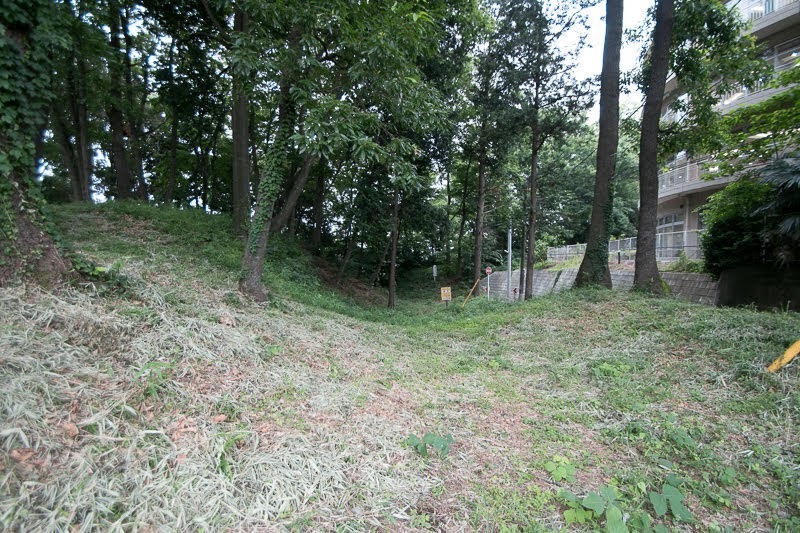 These temples and shrines are square shaped and has a trace of cliff at each line, and might be used as outer areas of Shakujii castle. Narrow road separating runs between these areas might be the ruin of old dry moat. 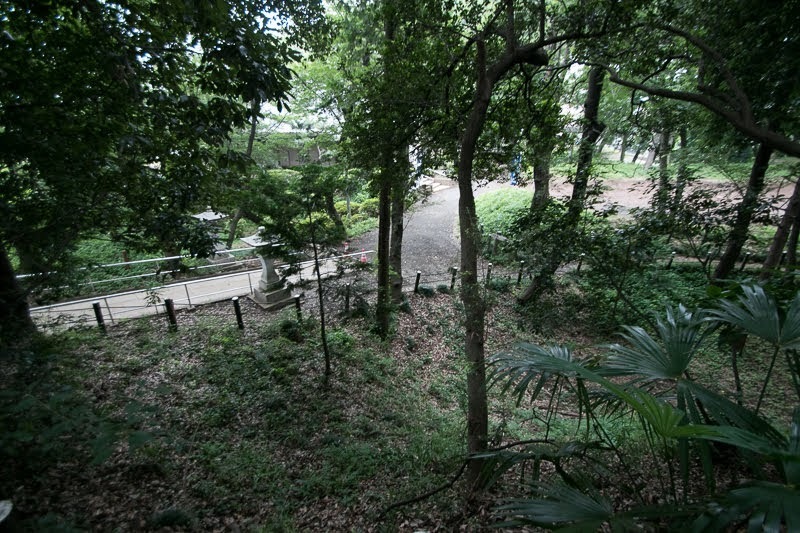 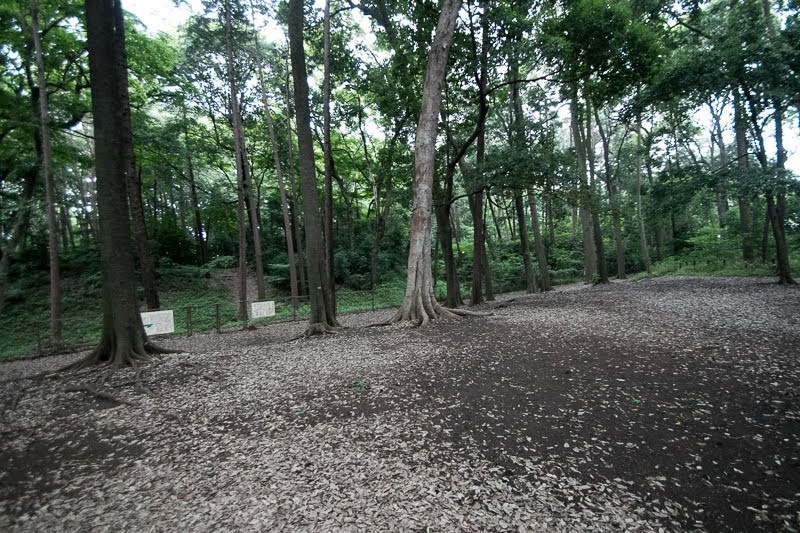 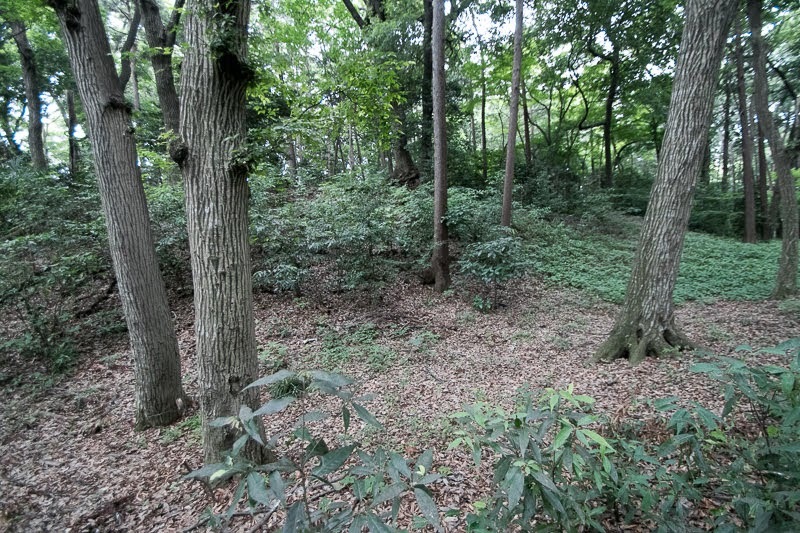 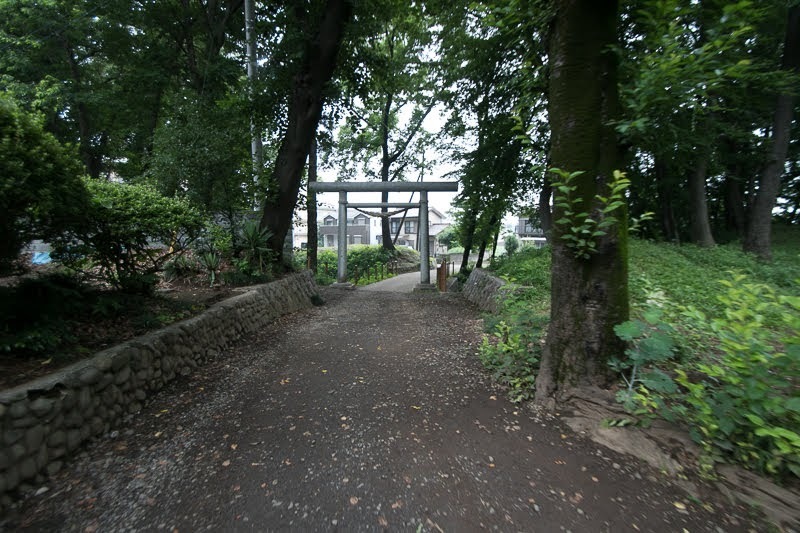 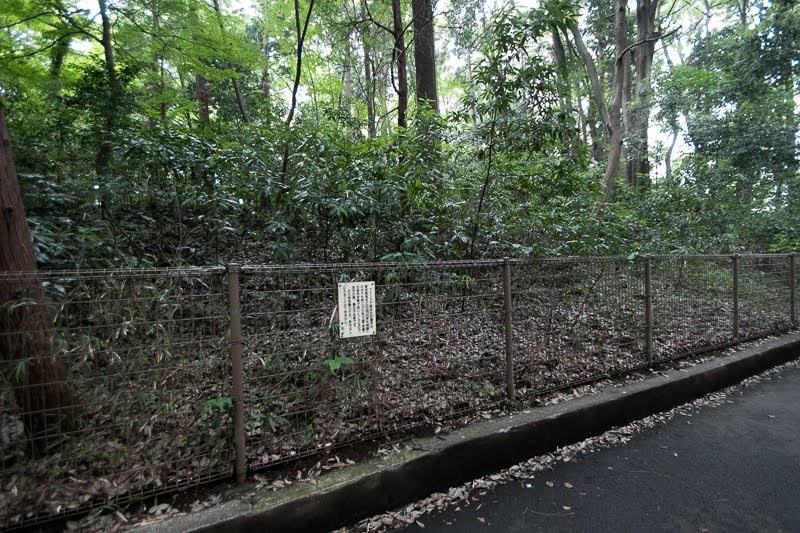 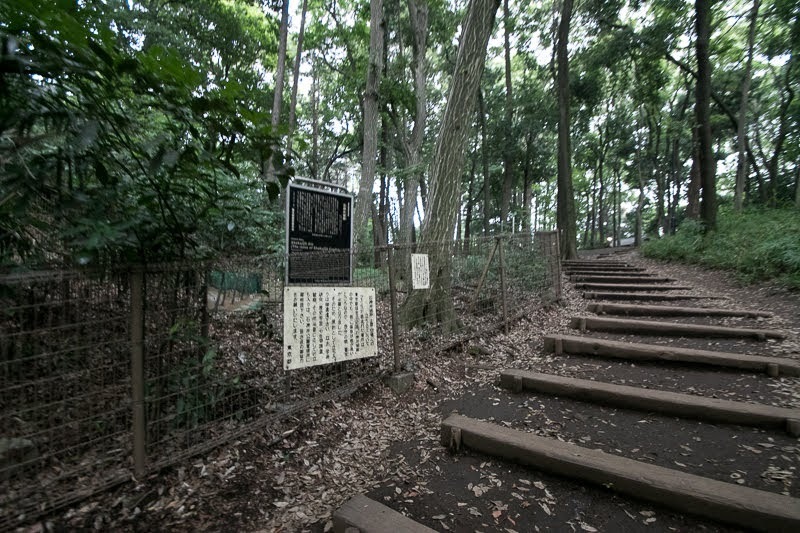 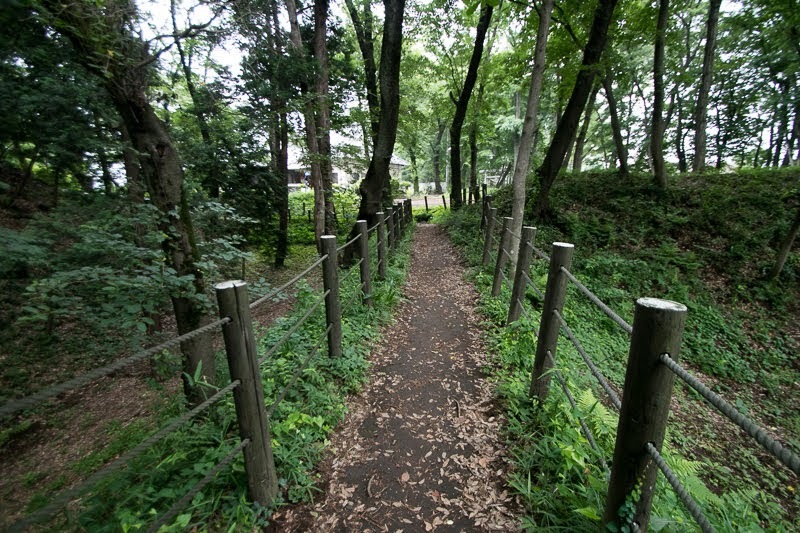 The east half of the plateau currently used as a part of Shakujii park might be used as residential area of retainers of Toshima clan. 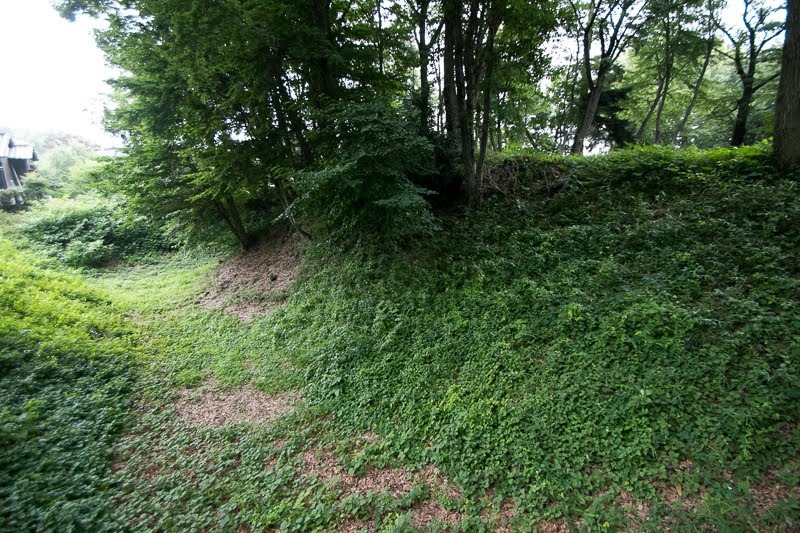 Although there is no remnant but there could be a fort at the tip of the height, to watch downstream of the river and besiege in case of emergency. 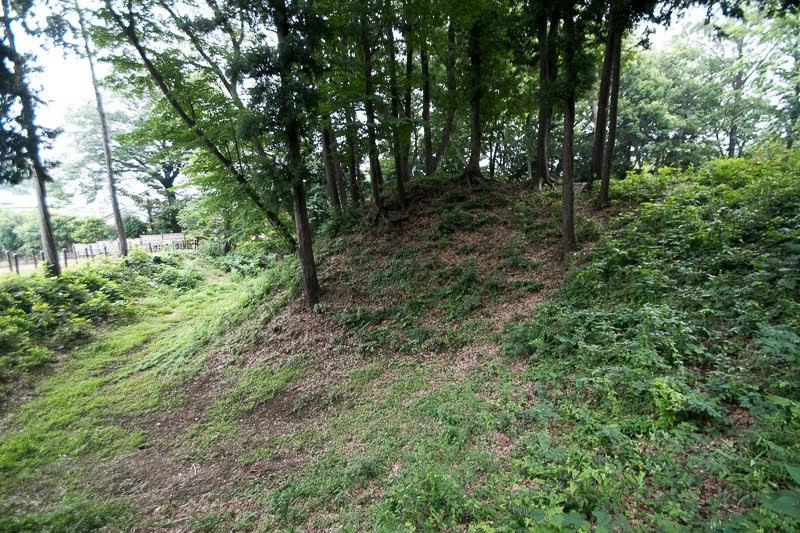 Core area of Shakujii castle is about 200 meter square and larger than surrounding castles of other local lords, and shows the prosperity of Toshima clan. In the middle of 15th century, peace of Kanto region was suddenly broken. 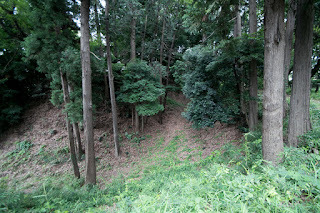 Kamakura Kubo highness, a representative of Muromachi Shogunate, and Kanto Kanrei, the highest retainer under Kamakura Kubo highness, became hostile by killing of Kanto Kanrei by Kamakura Kubo. 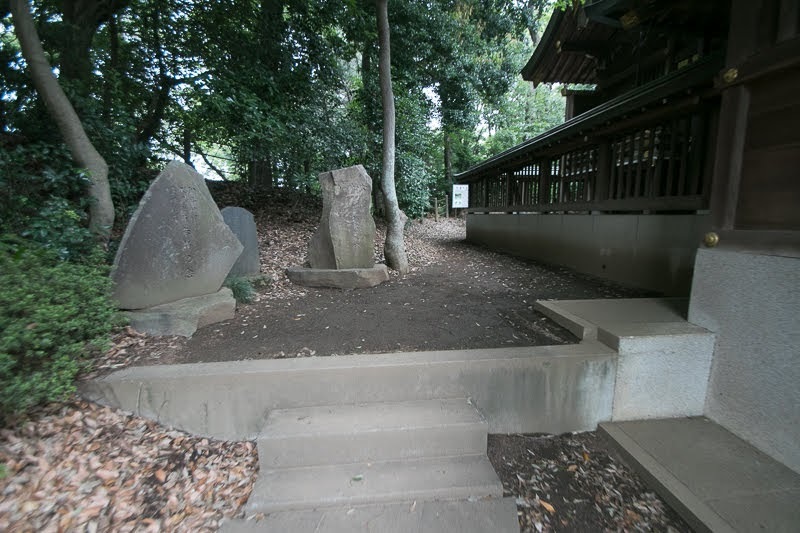 After the fierce battle, Kamakura Kubo highness was pushed out to the east half of Kanto region at the opposite side of Tone-gawa river formerly flow to Tokyo Bay, and west half of Kanto region was seized by Yamanouchi Uesugi clan, which was the house of Kanto Kanrei. 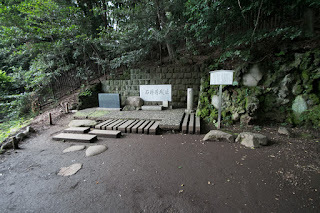 Toshima clan belonged to Uesugi clan and there was no problem at this point. 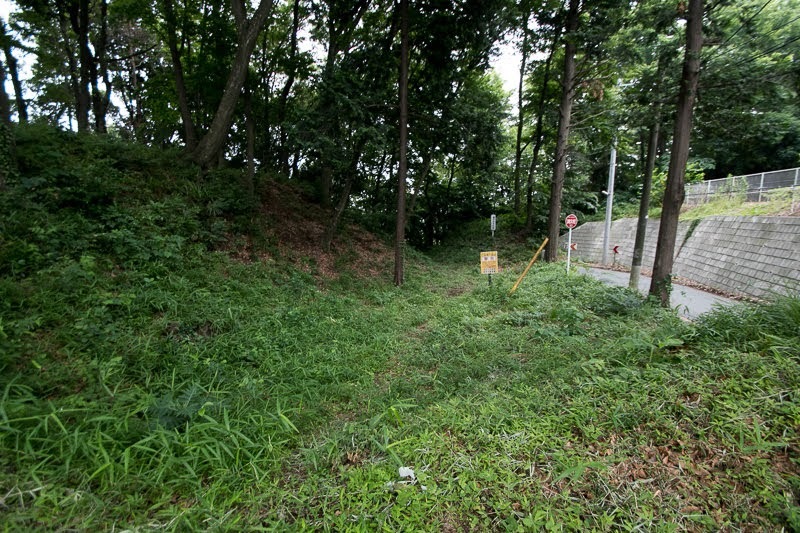 However, to confront Kamakura Kubo army at the east side of Tonegawa river, Dokan Ota (1432-1486), the magistrate of Ogigayatsu Uesugi clan, a major branch family of Uesugi clan, proceeded to the south half of Musashino plateau. 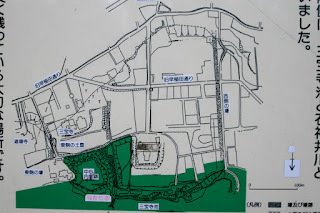 Dokan built Edo castle (Tokyo metropolis), Iwatsuki castle and Kawagoe castle (Saitama prefecture), and built triangle defense line toward Kamakura Kubo army. 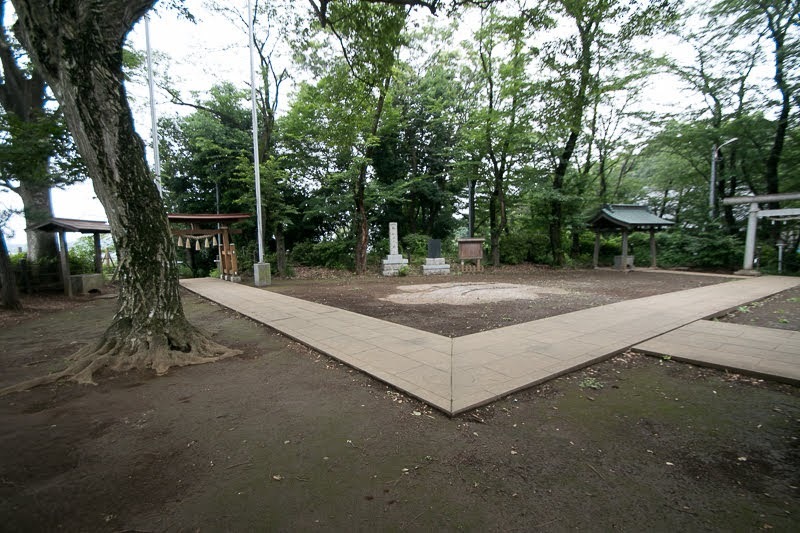 But this triangle defense line of Dokan directly overwrapped to the triangle territory of Toshima clan. 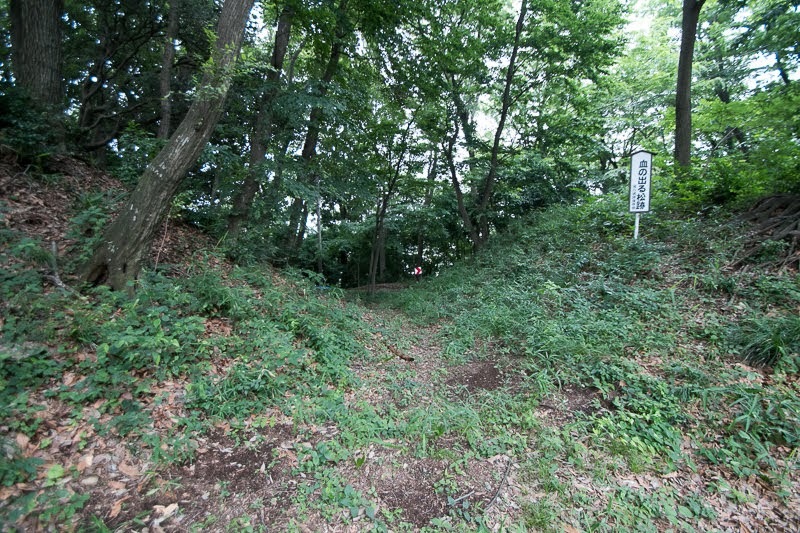 As Dokan was at higher position, territory of Toshima clan was gradually declined by the pressure of Dokan. Toshima clan increased their dissatisfaction toward Dokan gradually. 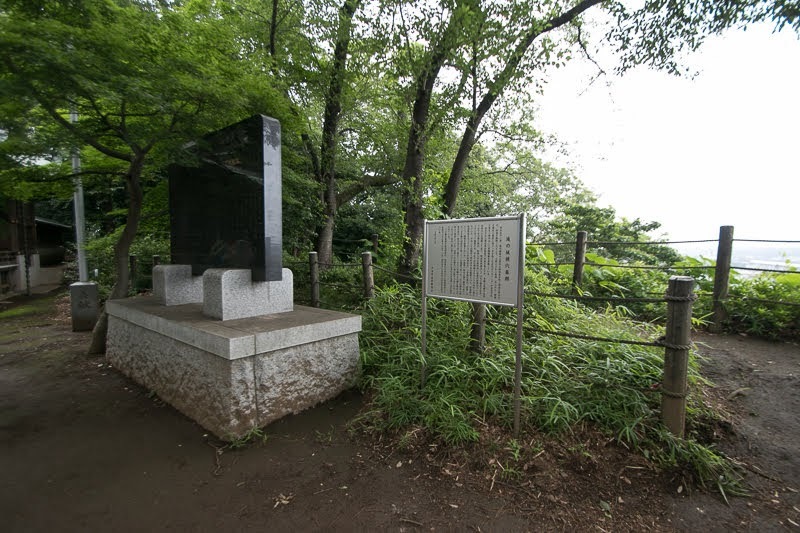 Amid such situation, Kageharu Nagao (1443-1514), the person of Shiroi Nagao clan which served the chancellor of Yamanouchi Uesugi clan but could not take that position, raised his army against Yamanouchi Uesugi clan in 1476. Kageharu at first invited Dokan Ota who was distant relative of Kageharu to join his attempt, but Dokan refused it and fought for Uesugi clan. 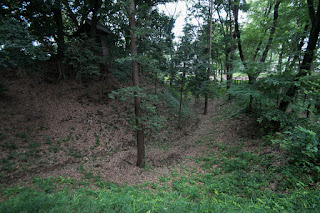 Different from former generation generals who just gathered and attacked the enemy, Kageharu and Dokan were revolutionaries who could plan dimensional strategy using castles as critical points. 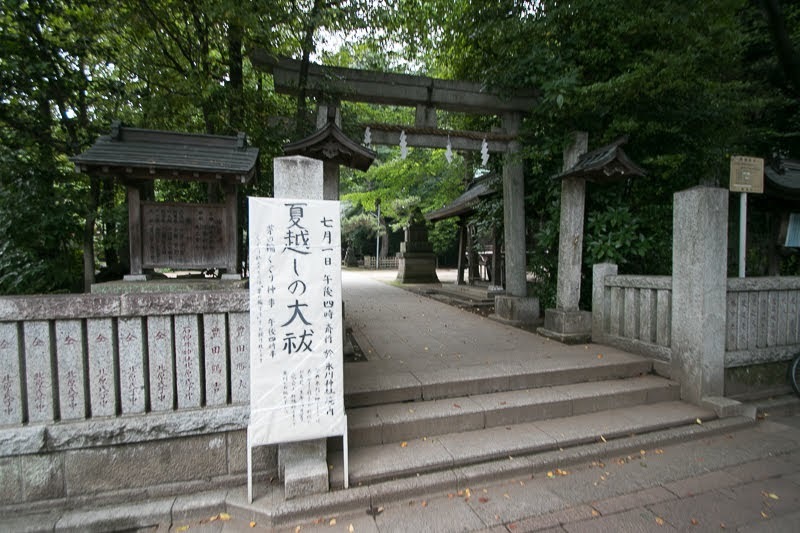 In 1477 Kageharu urged Yasutsune Toshima (?-? ), the leader of Toshima clan, to raise army to restrain Dokan at backward and separate from main army of Uesugi clan stayed at Ikakko area. 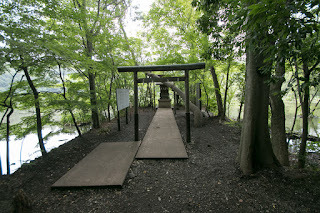 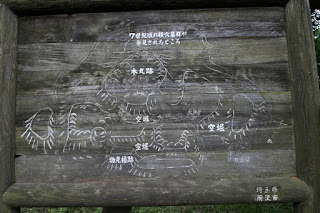 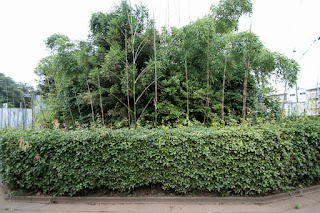 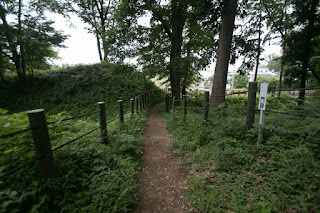 Dokan who was separated the connection from Edo castle to Iwatsuki castle or Kawagoe castle by Toshima clan needed to recover the route as soon as possible. 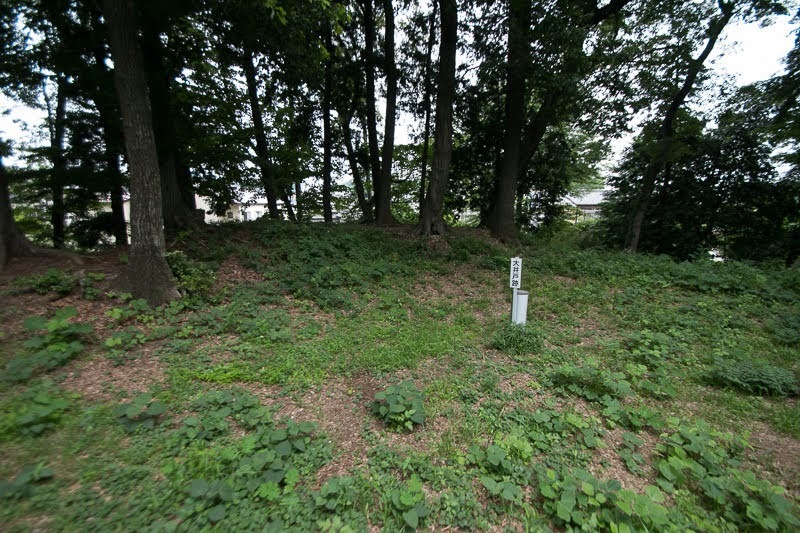 If Toshima clan firmly secured their castles it would take time to break it, thus Dokan burnt down the castle town of Nerima castle, the branch castle at the center of territory by small army. 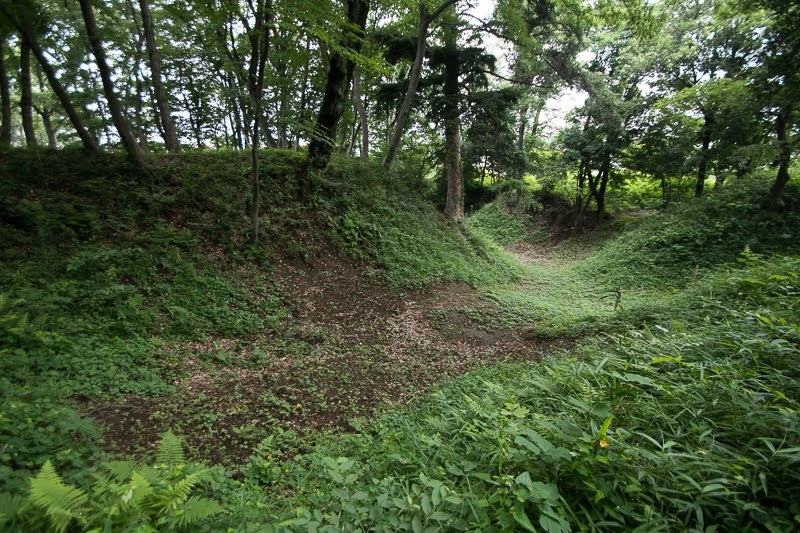 Toshima clan responded this provocation thus gathered their army from each castles then attacked the army of Dokan. 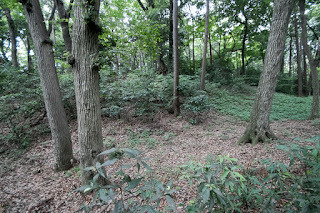 But Toshima army suffered severe defeat by ambush tactics of Dokan at the battle of Egoda, and lost many soldiers along with younger brother of Yasutsune Toshima. 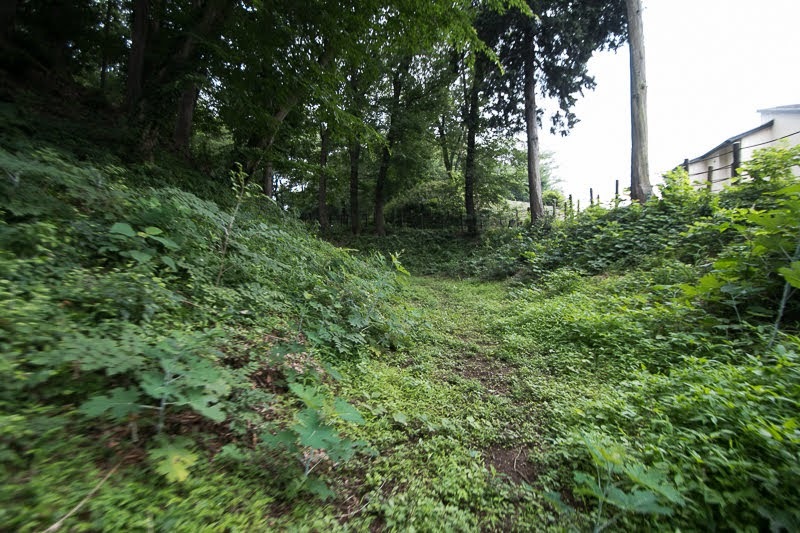 Yasutsune Toshima barely ran to Shakujii castle once surrendered to Dokan. 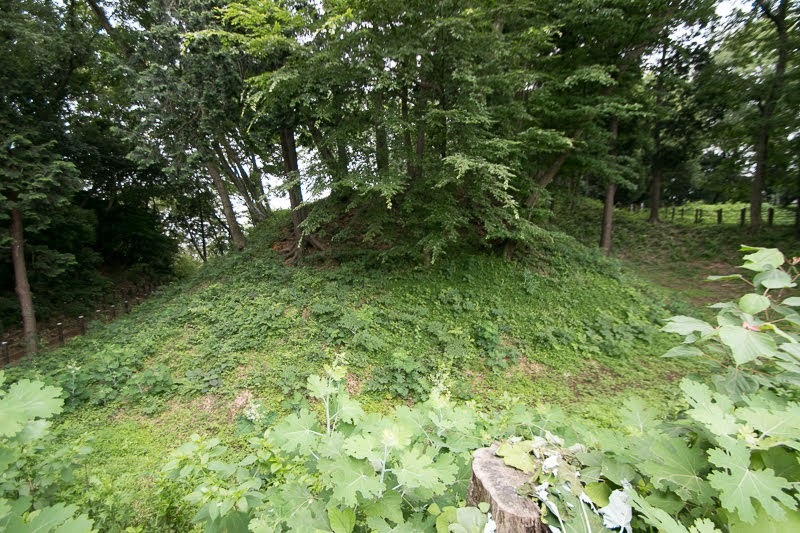 But as Yasutsune did not destruct Shakujii castle as decided under the condition of peace, Dokan attacked Shakujii castle then Yasutsune escaped from castle. As a fictional tale, at the time of fall Yasutsune gallantly dived into Sanpoji pond riding white horse to kill himself, and his daughter Princess Teruhime followed it. 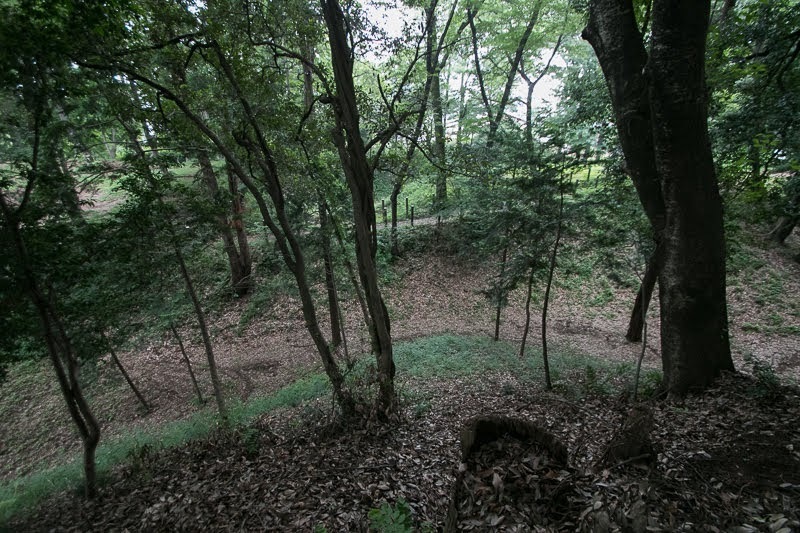 In fact, Yasutsune survived this time and next year rose against Dokan again, but faced the attack of Dokan then went missing. 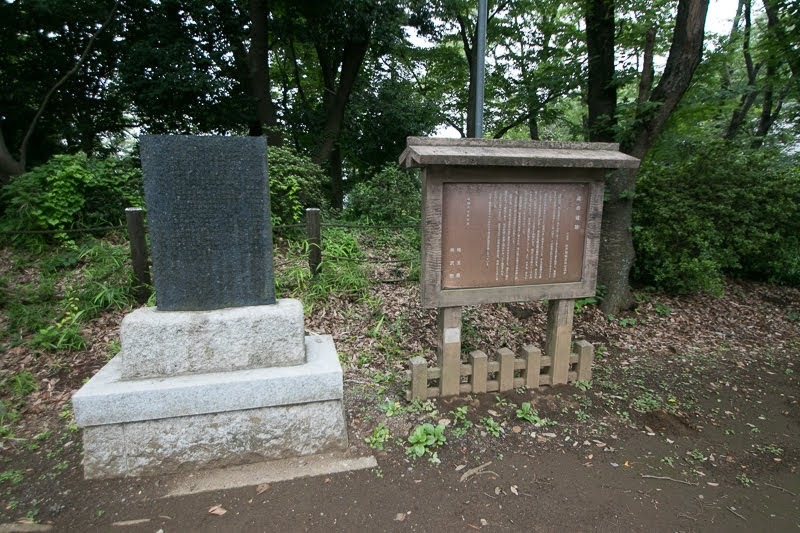 Toshima clan held north part of Tokyo area over 400 years ended their history, being involved the conflict of two revolutionaries. Dokan who achieved the territory of Toshima clan became strong, but was later assassinated by his master Ogigayatsu Uesugi clan which feared the strength of Dokan. As Dokan did not use Shakujii castle, the castle was abolished and was never used again. 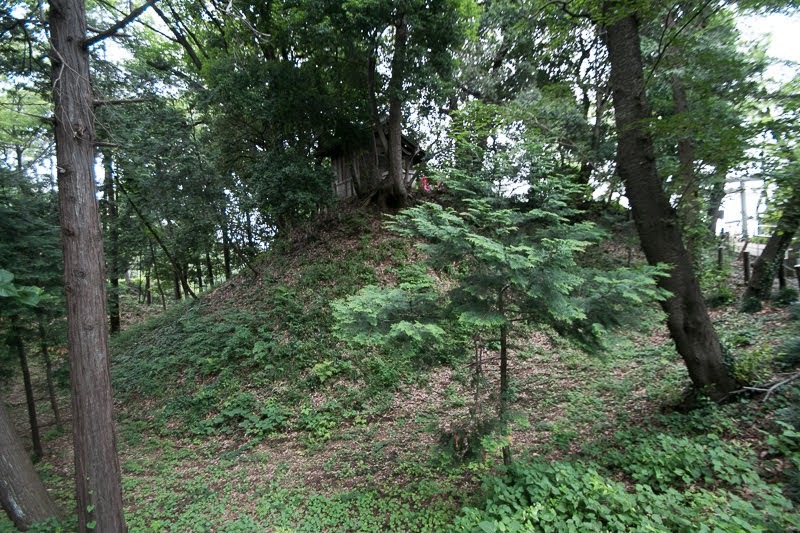 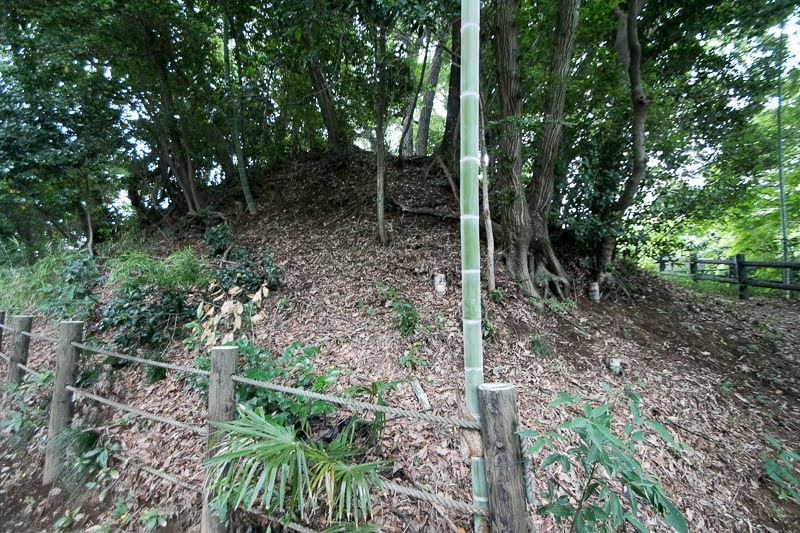 As the castle site was used as ground of shrines and temples to memory lost Toshima clan, losing most part of structure but atmosphere of the castle is still kept along with the clay wall of central area. 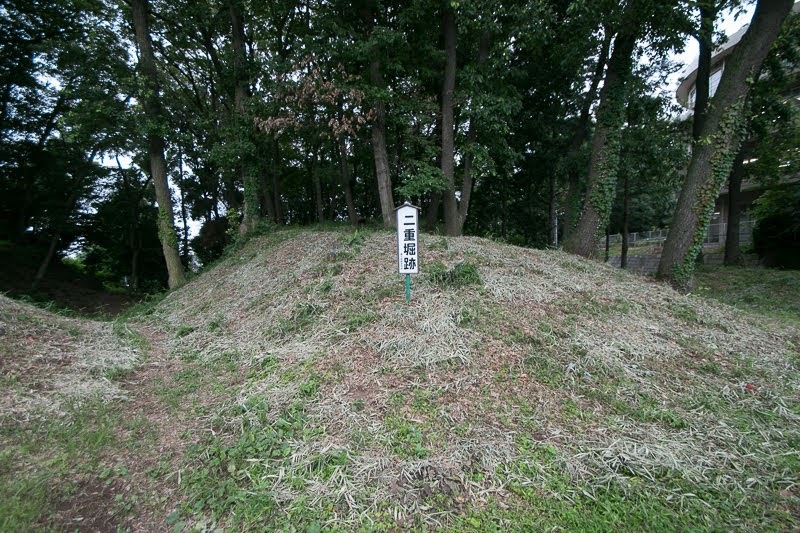 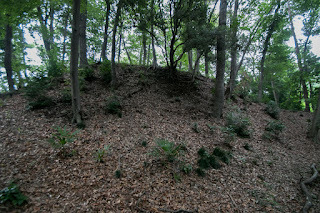 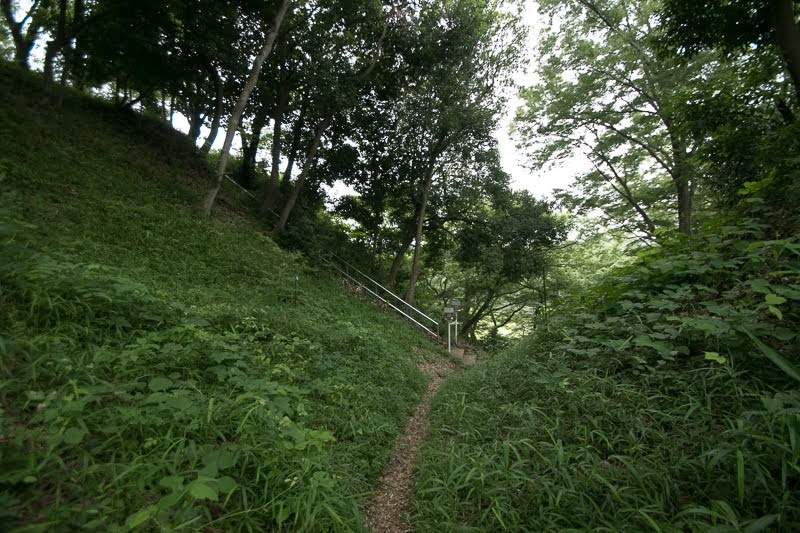 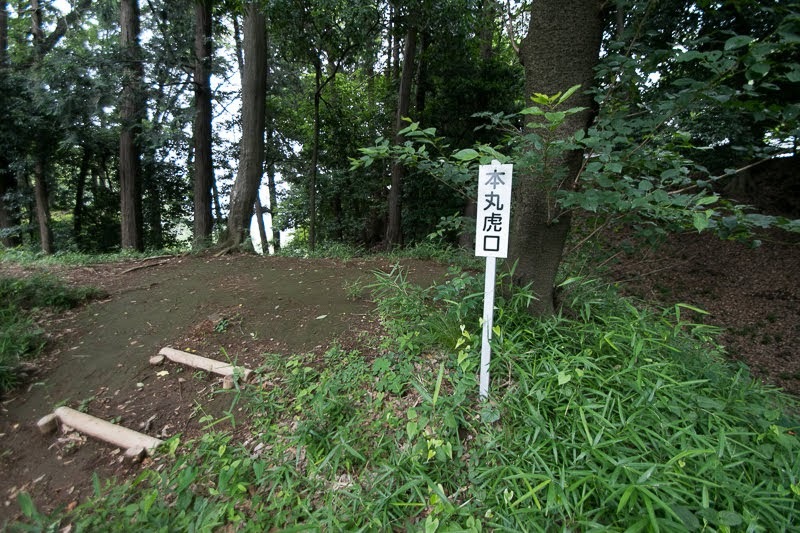 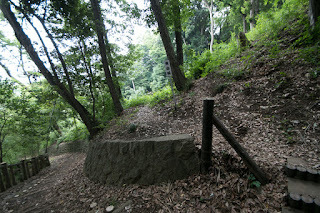 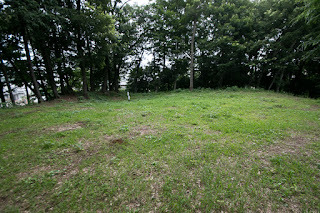 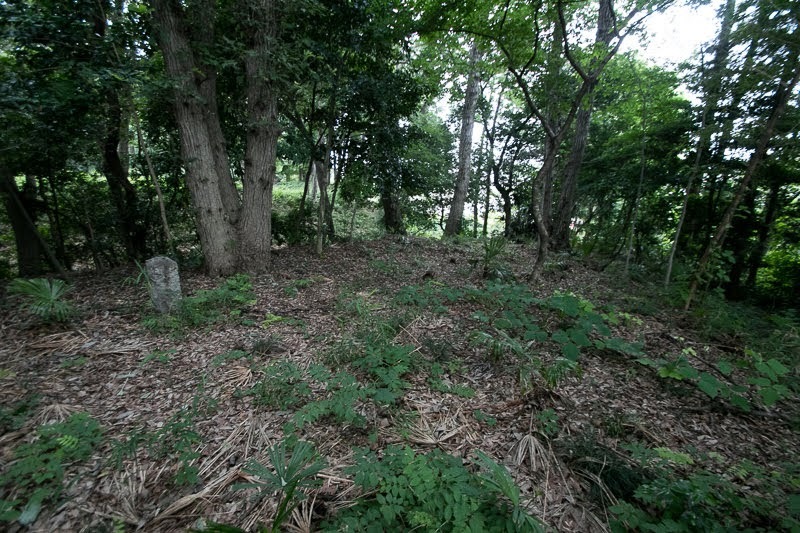 As the castles of Toshima clan were generally built at the edge of plateau, even though the structure was lost but there terrain shows the existence of castle well in the town. 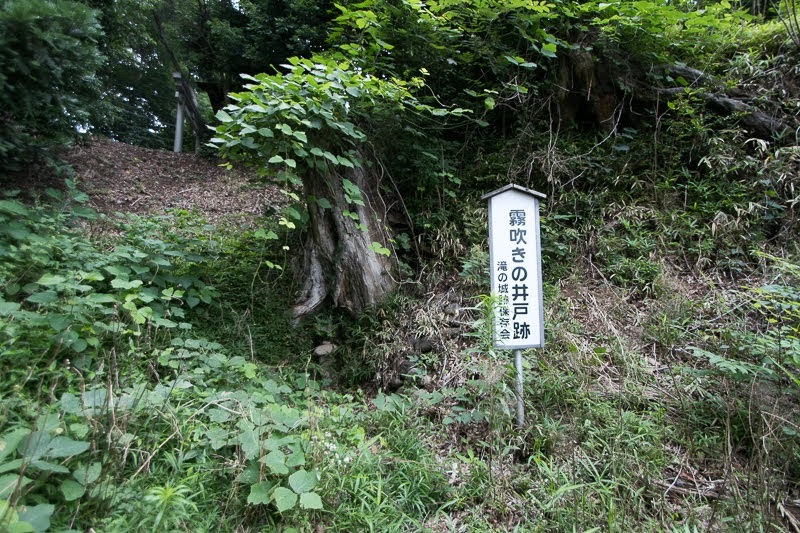 Beside, many of former castle town grew to the core of the area and becomes the places of train station with its name. 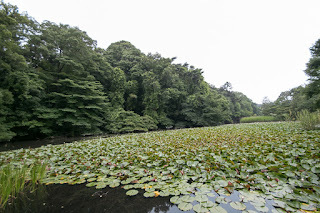 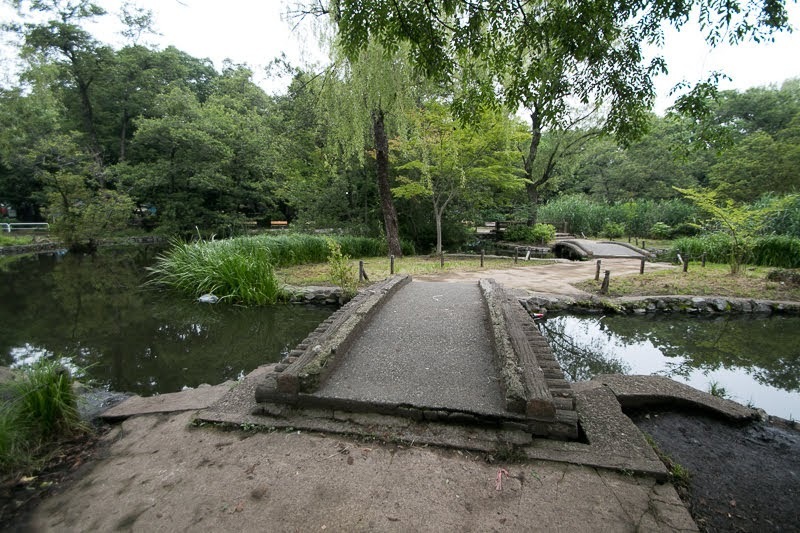 Clear water of the pond tells the name of Toshima clan as the pioneer of Tokyo area until now, along with the place names around the north half of Tokyo metropolitan area. 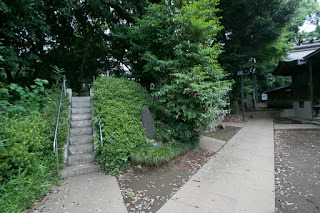 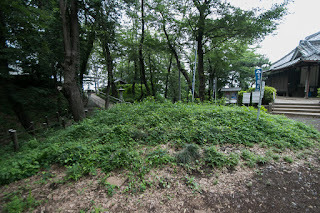 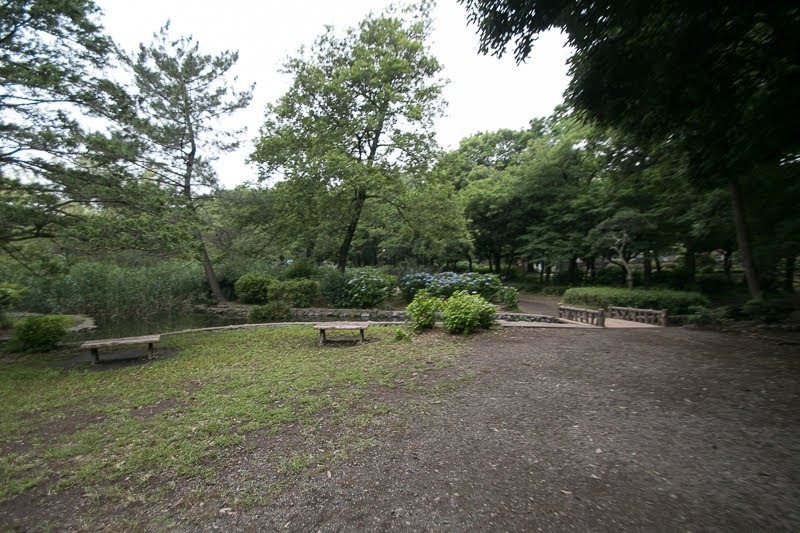 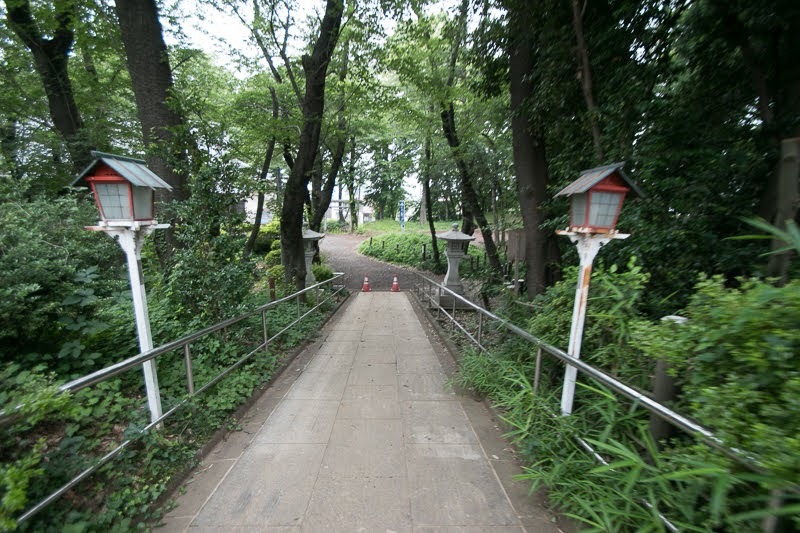 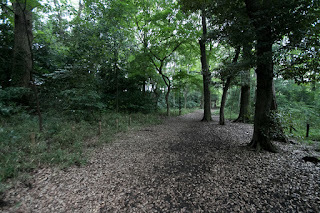 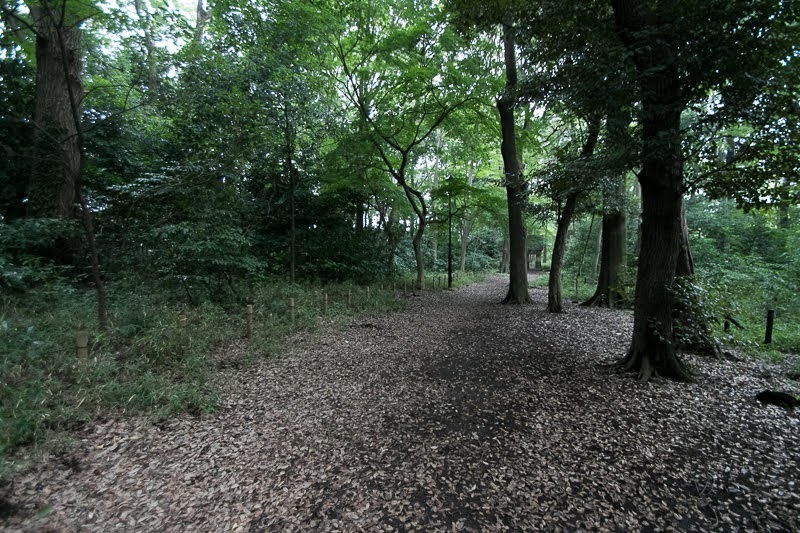 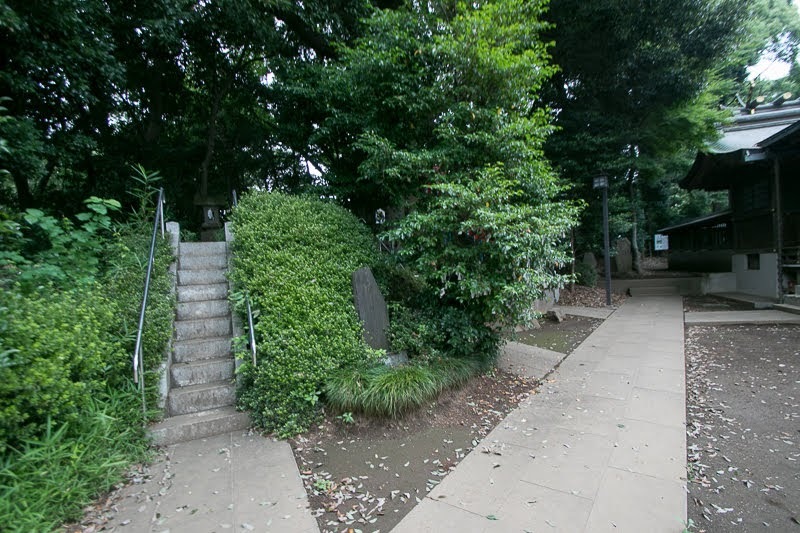 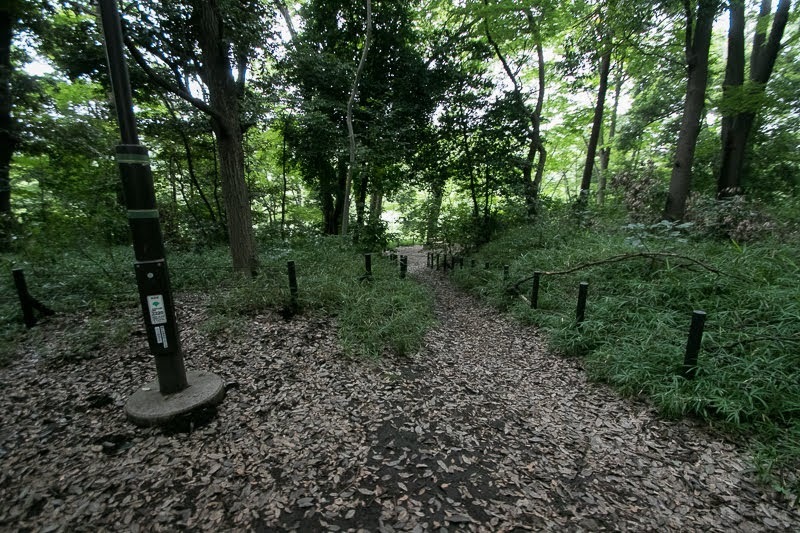 15 minutes walk from Seibu Ikebukuro line Shakujii-Koen station. 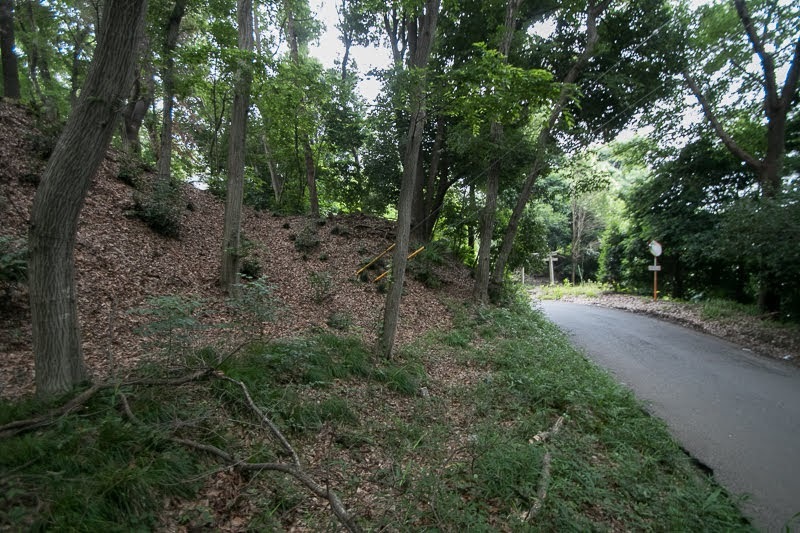 15 minutes drive from Kanetsu Jidoshado Expressway Oizumi interchange. 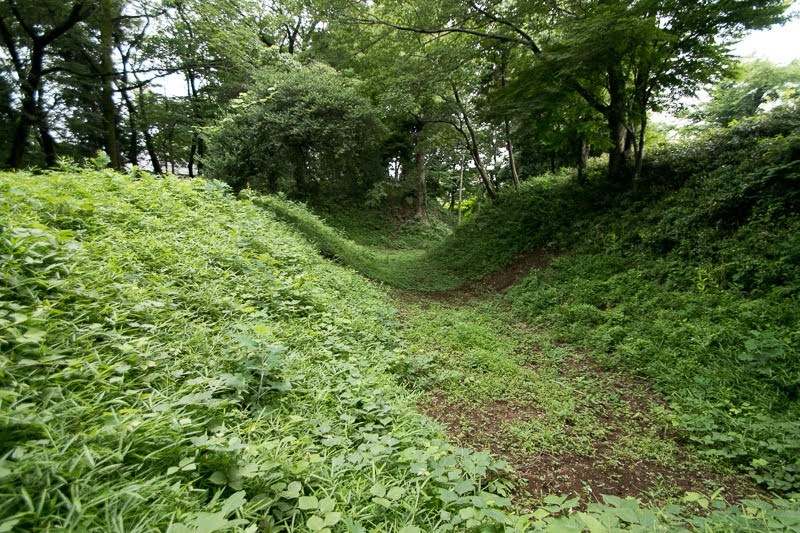 Takinojo castle (滝の城) is located at the edge of river terrace of Yanase-gawa river, a tributary of Arakawa river in the southeastern edge of current Tokorozawa city. 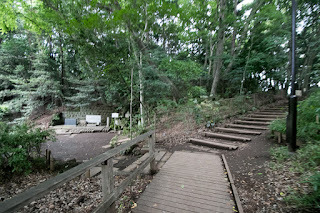 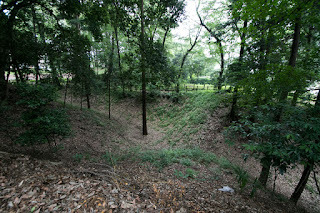 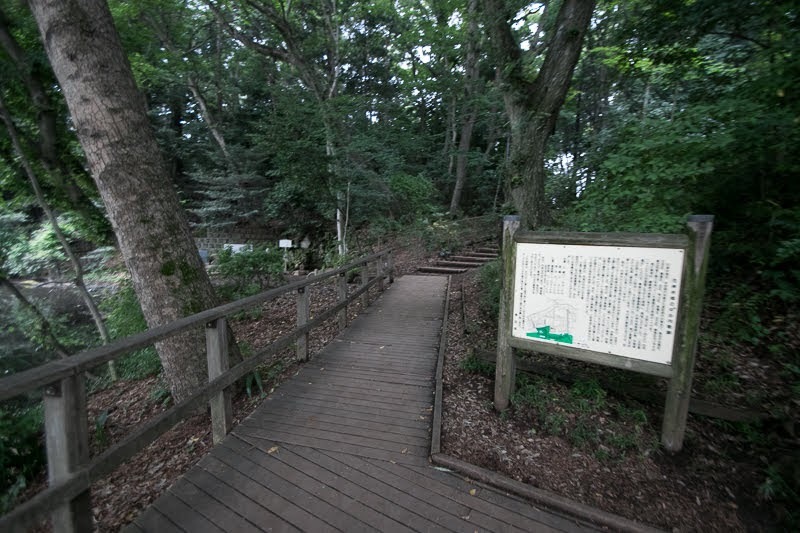 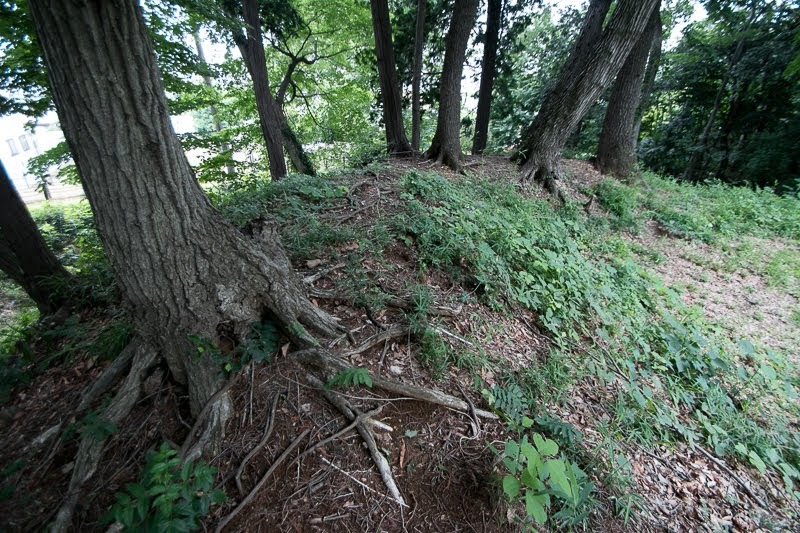 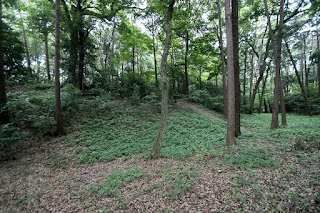 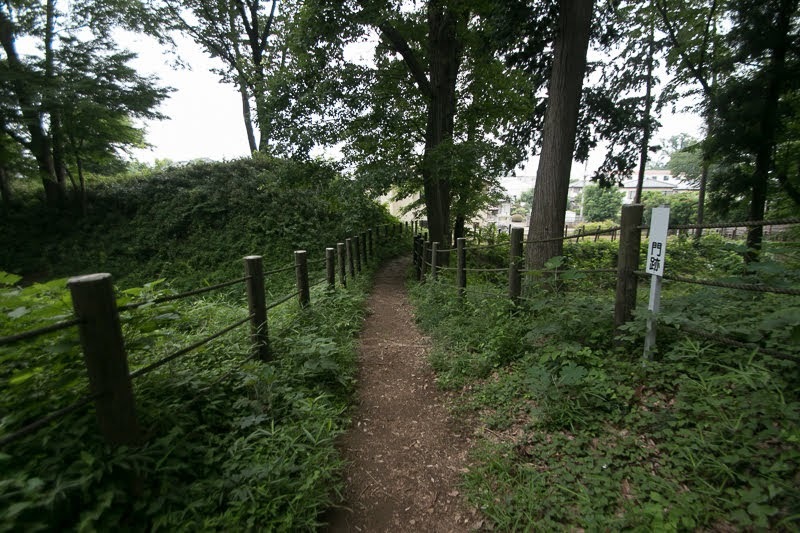 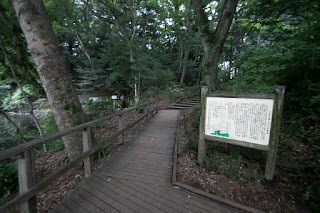 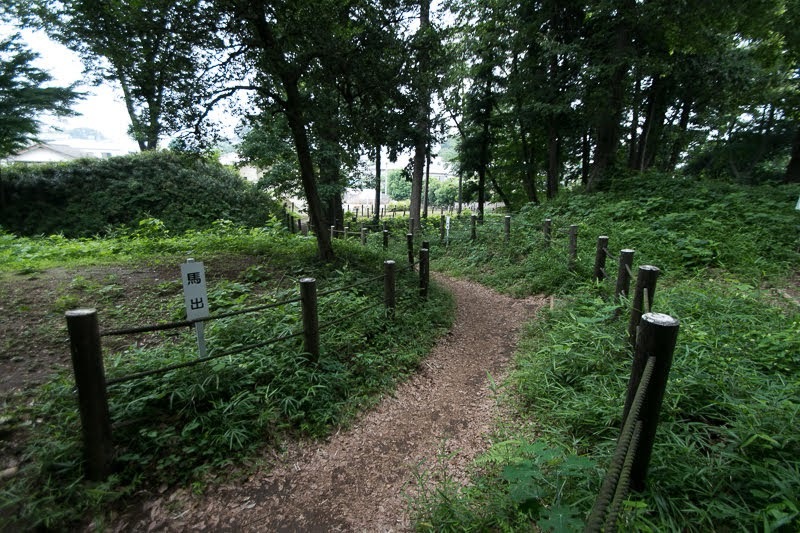 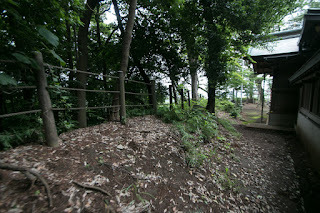 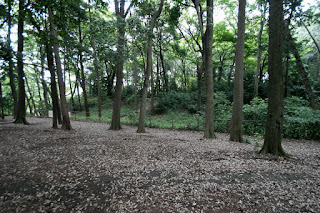 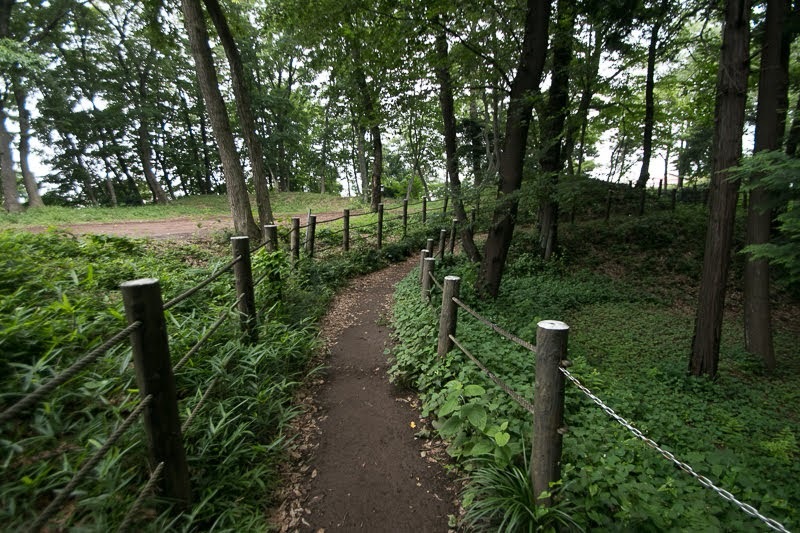 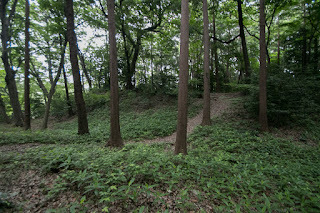 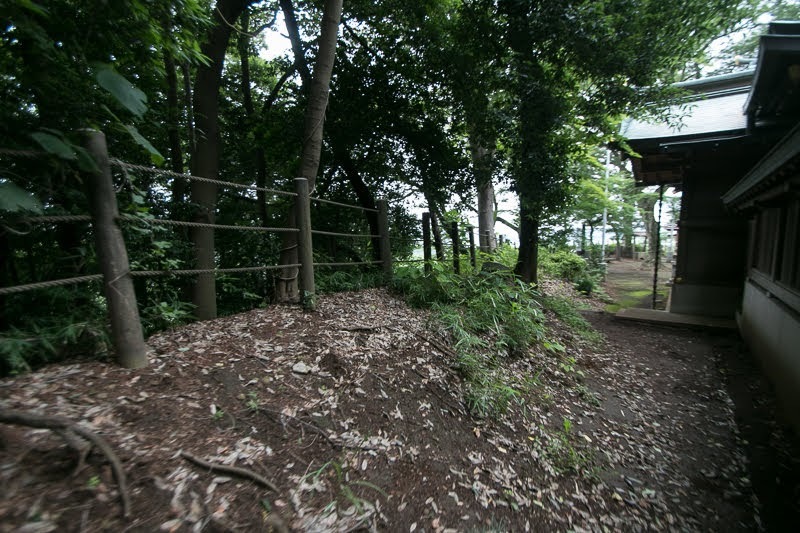 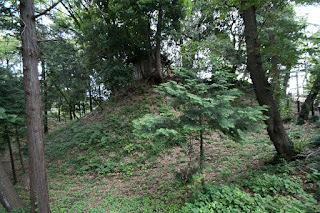 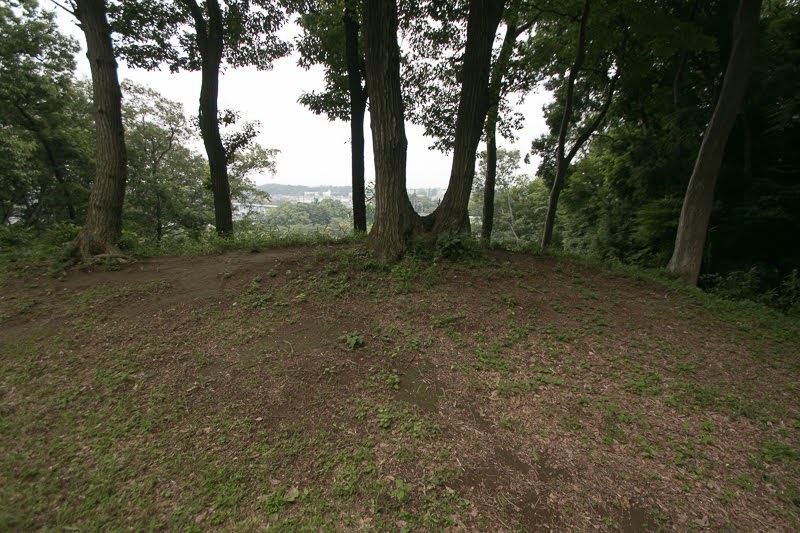 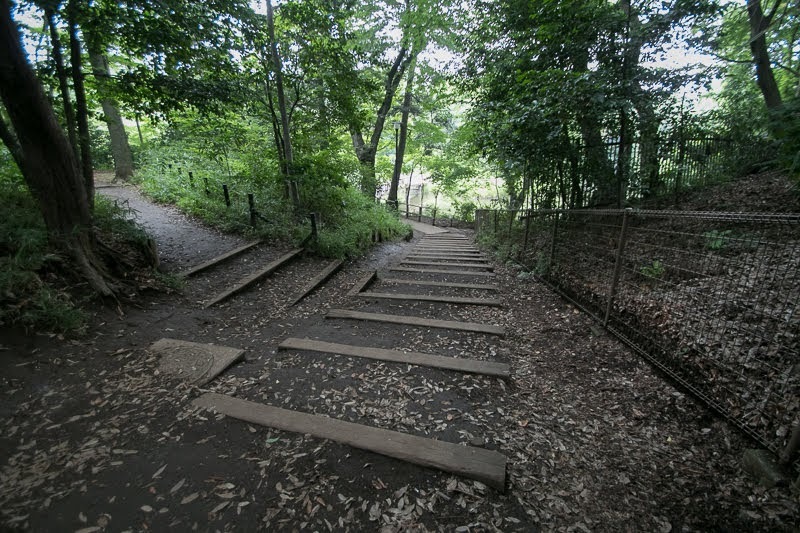 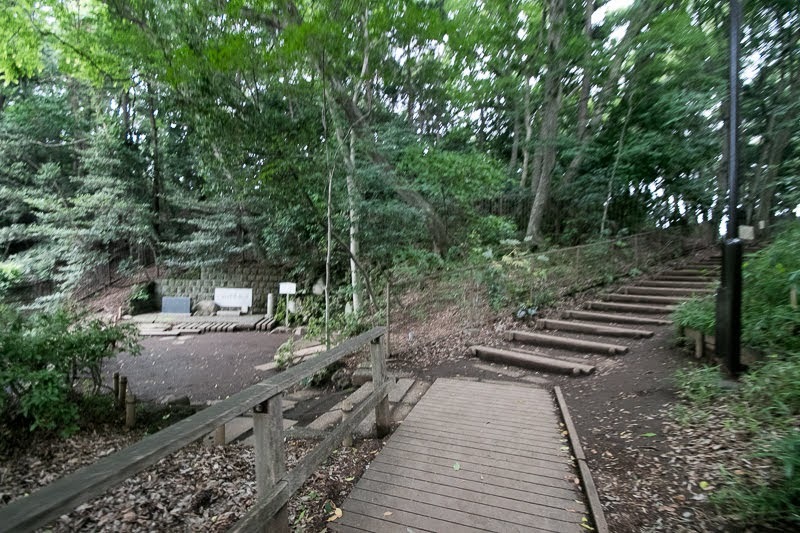 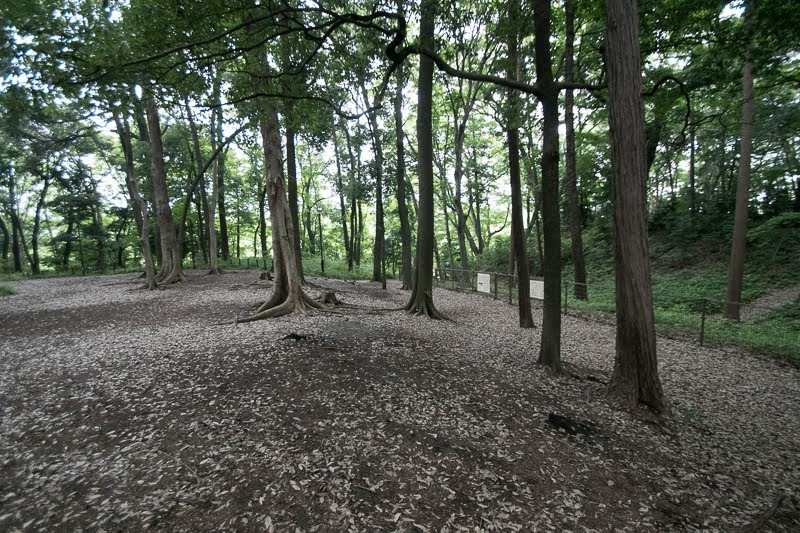 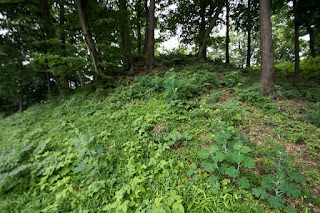 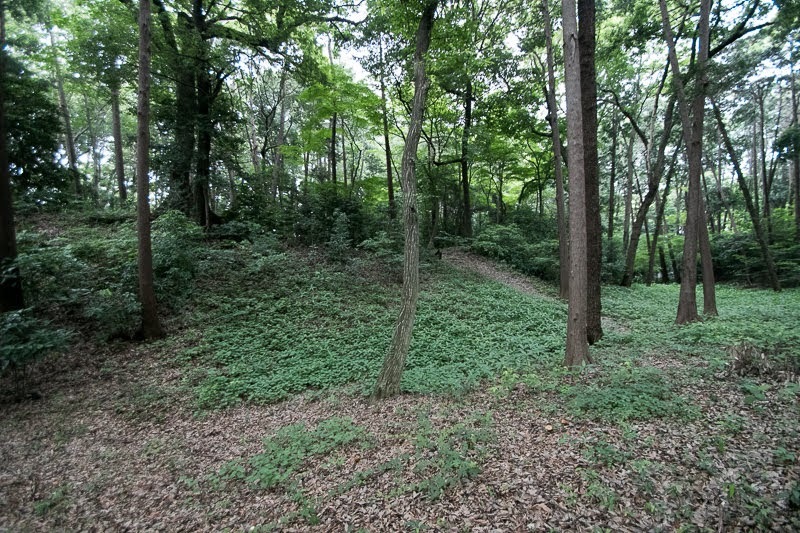 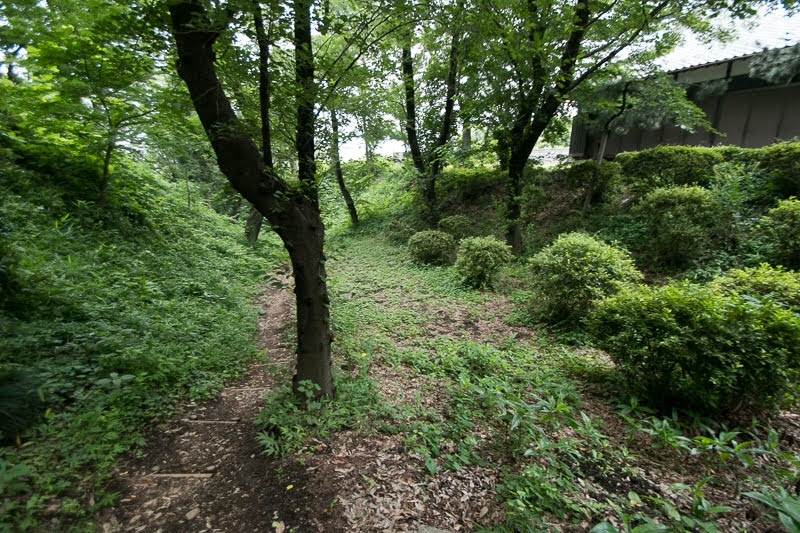 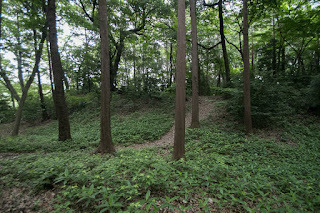 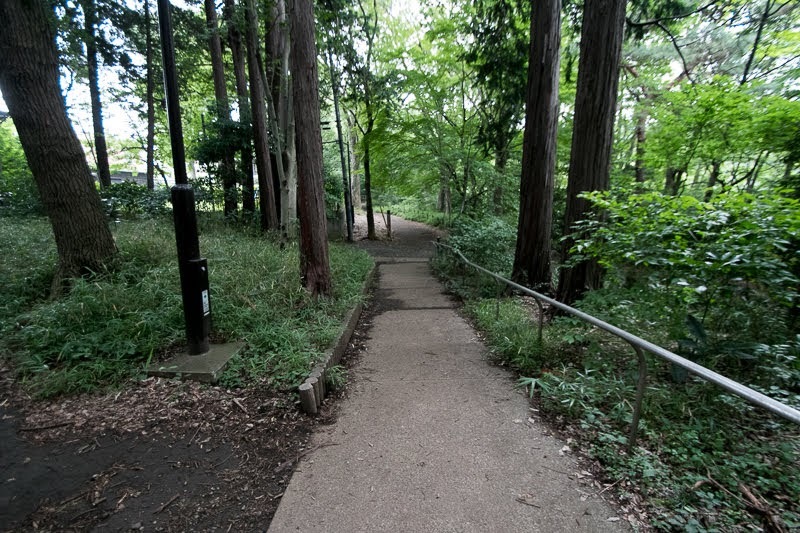 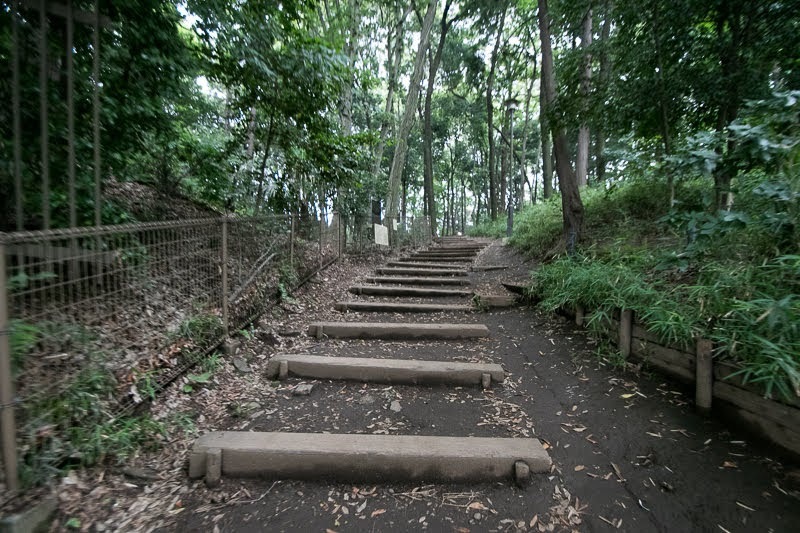 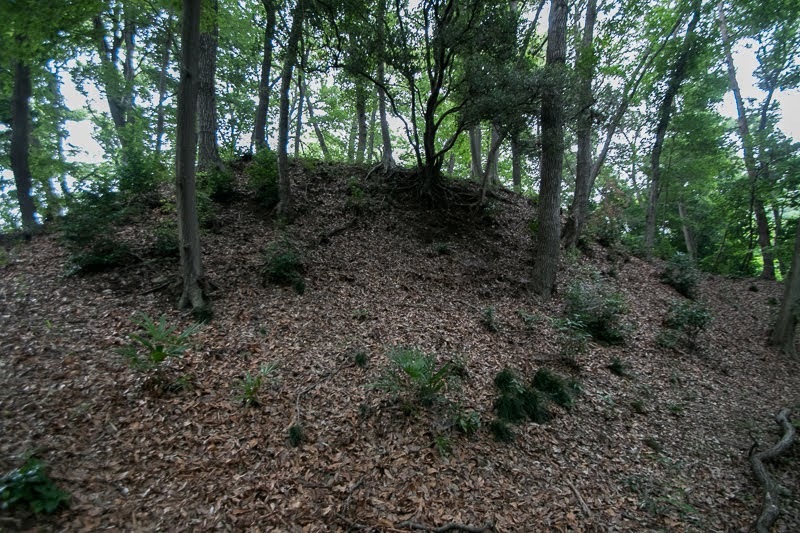 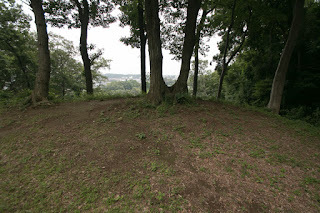 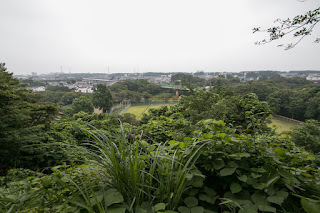 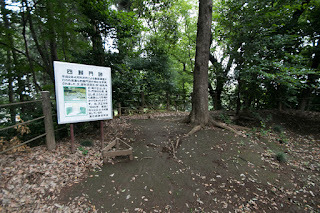 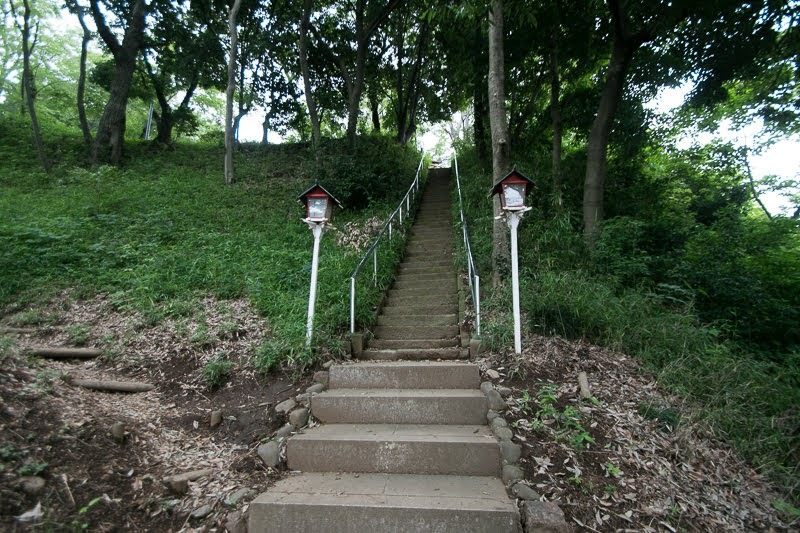 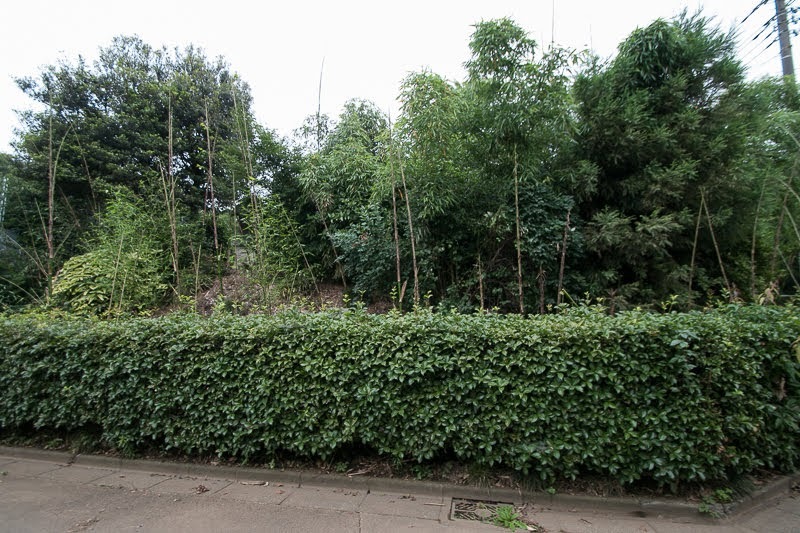 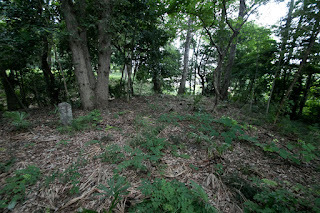 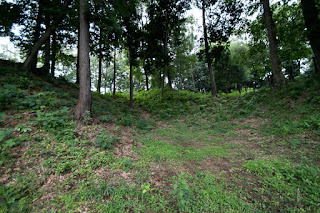 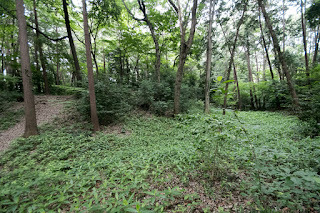 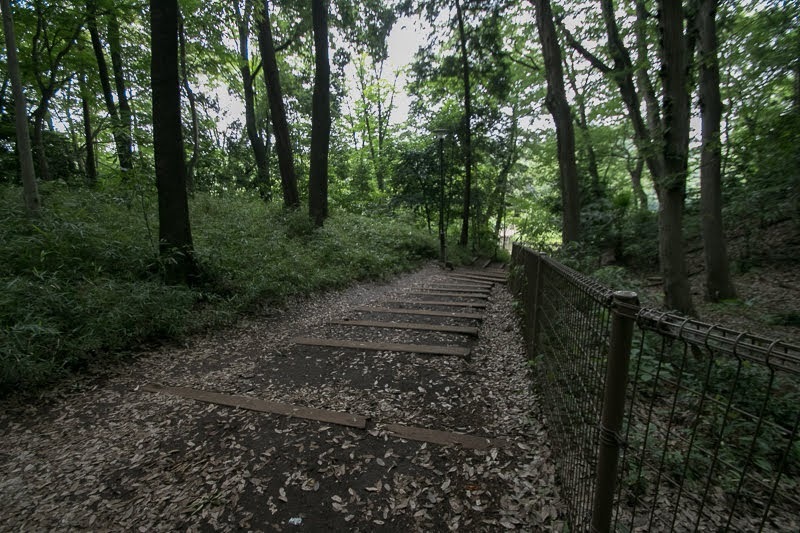 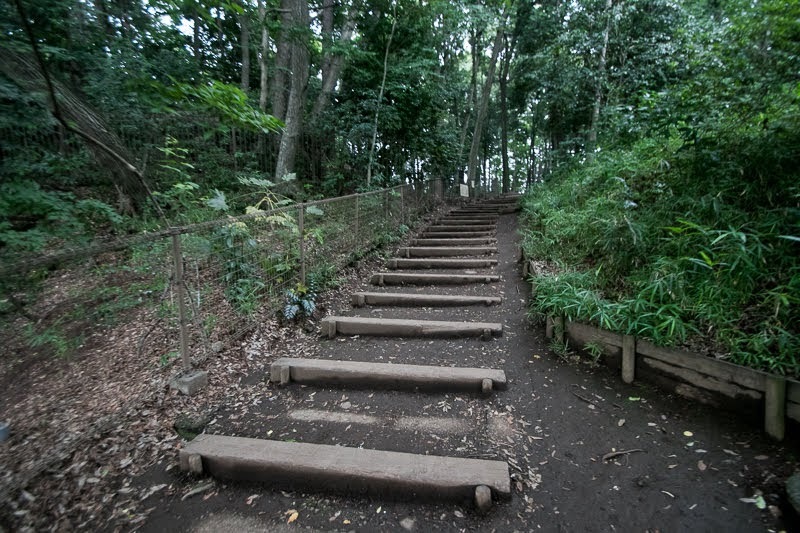 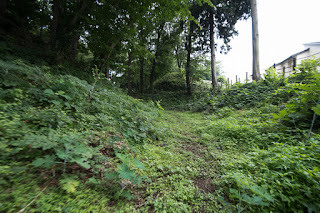 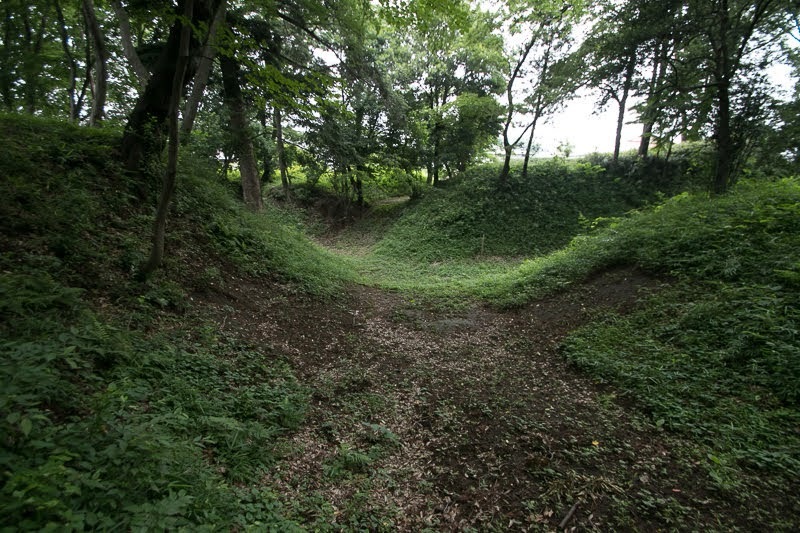 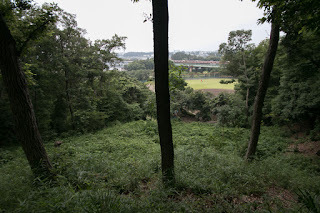 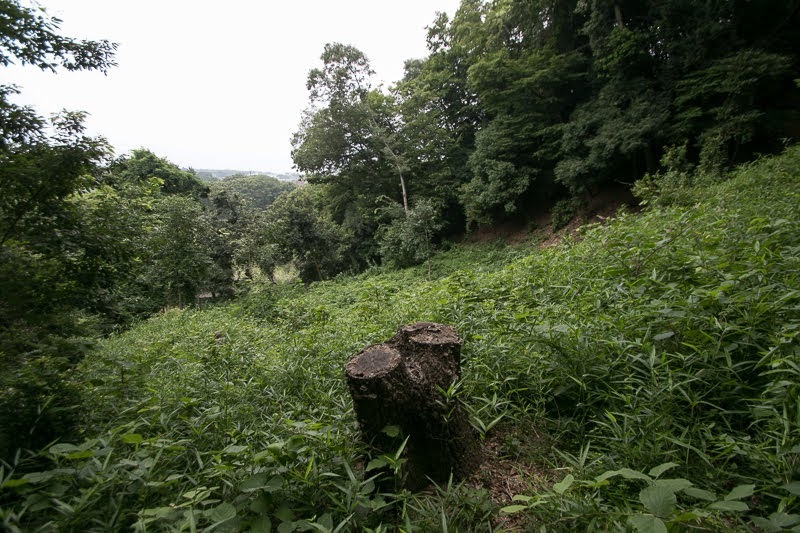 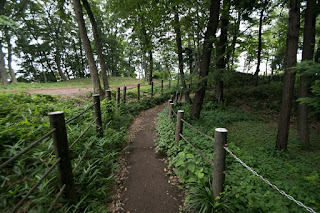 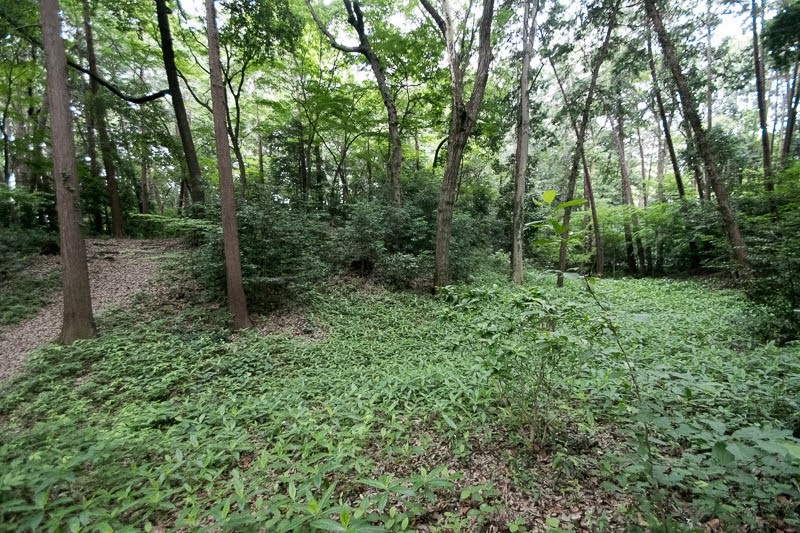 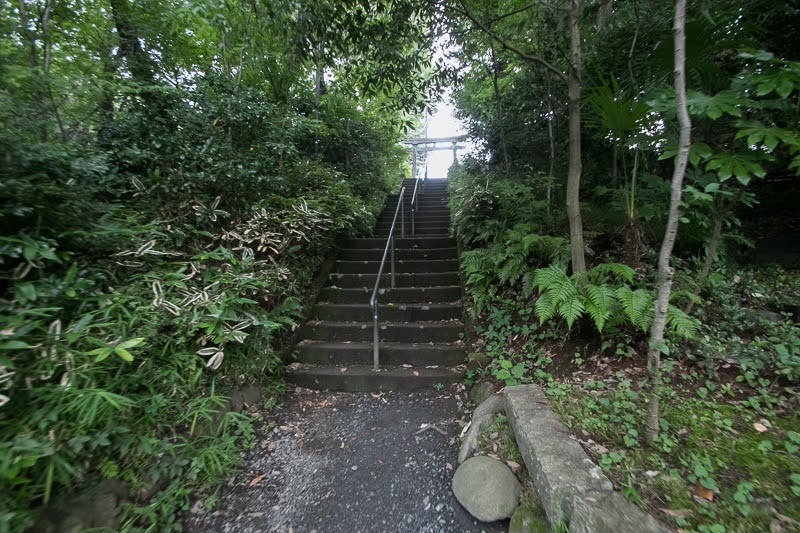 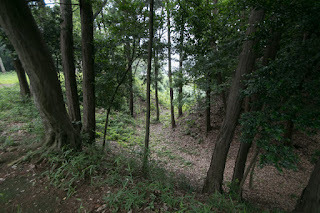 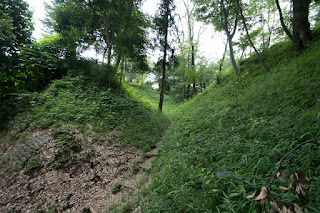 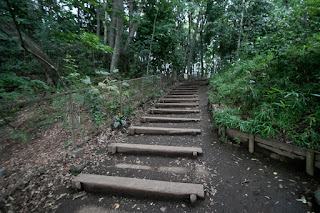 Castle site is about 3 kilometer inward from the edge of Musashino Plateau, which ends at the cliff formed by Arakawa river that flows curvedly toward southwest to Tokyo Bay. 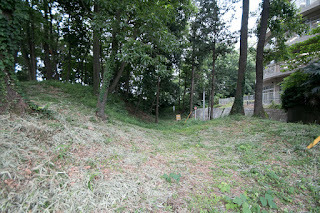 Castle site is near to the crossing point of Kawagoe-Kaido road, which connects Tokyo city central and Kawagoe city north and southward which passes a bit inland from the edge of cliff avoiding small valleys, and east and westward road from Ome area or Hachioji area to current Saitama city. 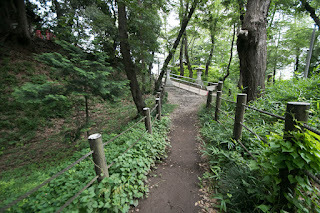 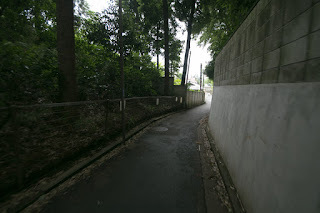 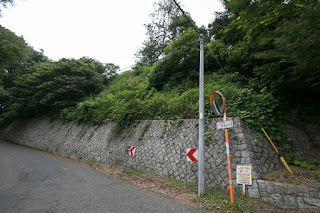 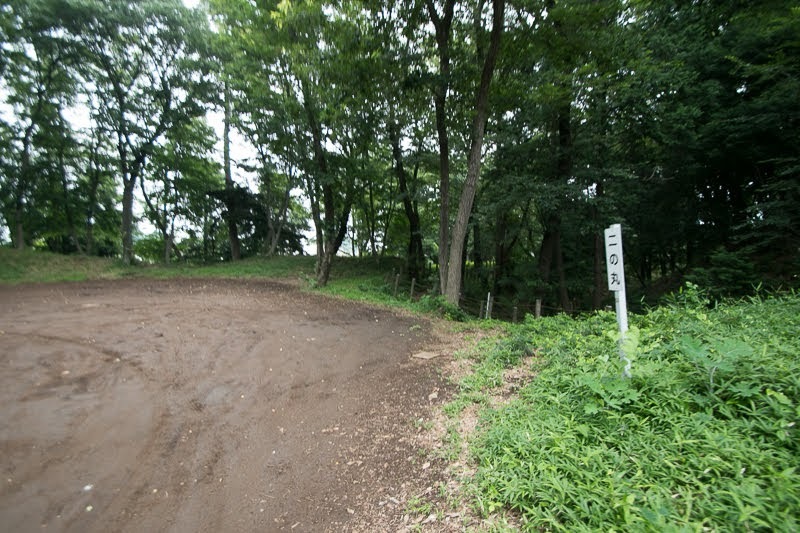 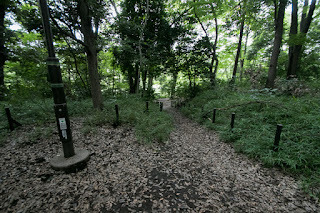 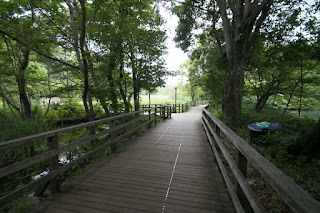 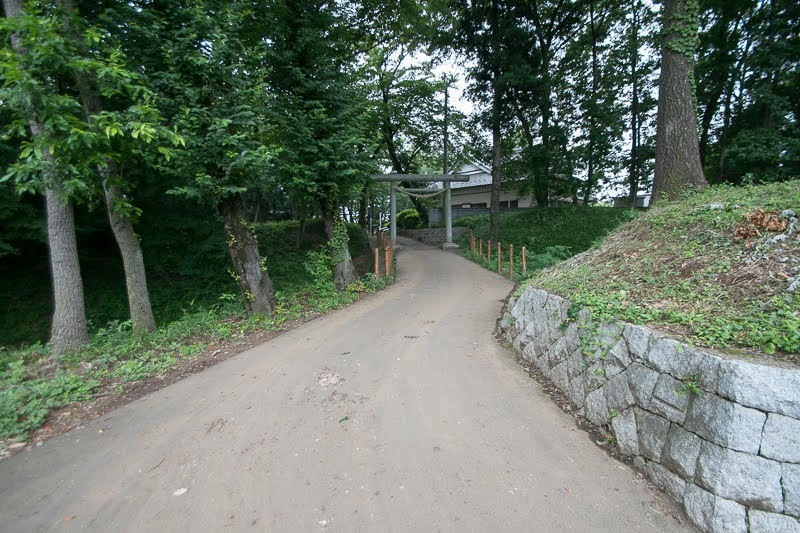 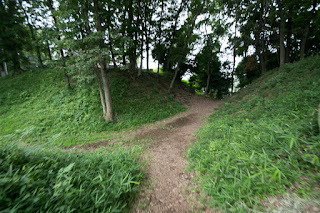 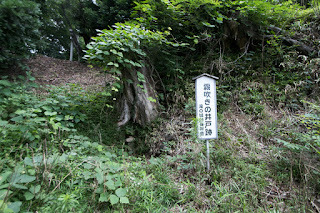 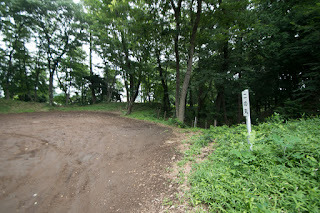 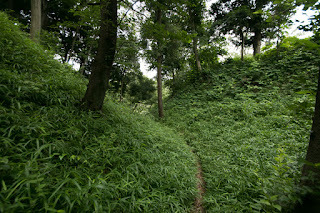 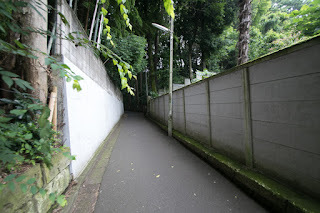 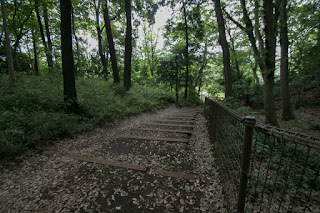 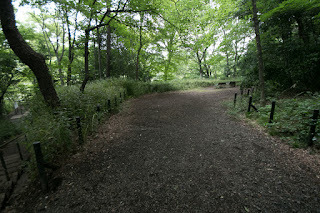 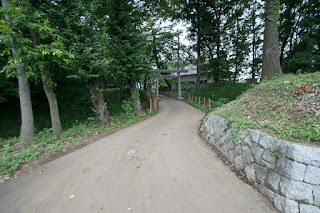 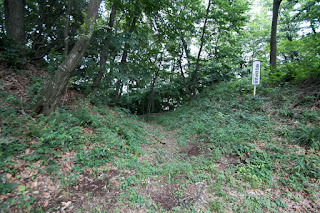 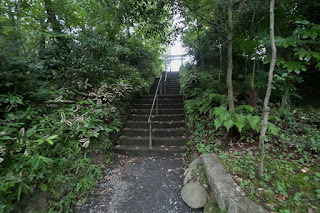 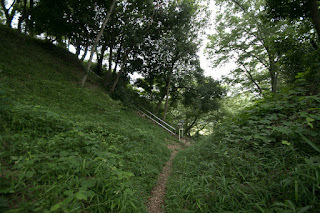 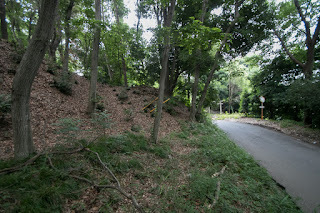 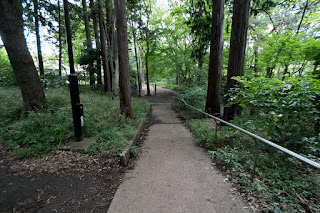 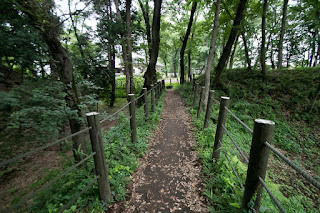 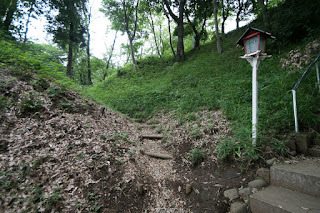 These two roads are exactly the raison d’?tre of Takinojo castle. 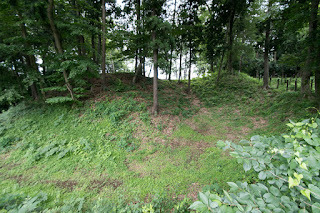 The origin of Takinojo castle is unknown and it might be built by Oishi clan, which was a deputy governor of Musashi province (Tokyo metropolis and Saitama prefecture) which was the lord of Takiyama castle (Tokyo metropolis), but also said as been built by Dokan Ota (1432-1486), a chancellor of Ogigayatsu Uesugi clan which reigned south part of Musashi province in the latter half of 15th century. Ogigayatsu Uesugi clan was a branch family of Uesugi clan, a high class retainer of Muromachi Shogunate and was named as Kanto Kanrei, a supervisor of Kanto region supports Kamakura Kubo Highness, a representative of Muromachi Shogunate at Kanto region. 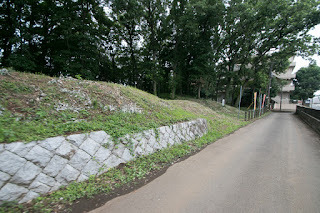 Their main family Yamanouchi Uesugi clan kept Kanto Kanrei position and Ogigayatsu Uesugi clan followed to them. 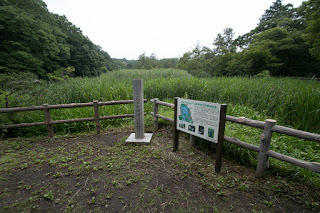 In middle of 16th century, Kamakura Kubo highness and Uesugi clan broke and made fierce battles, and as a result they divided Kanto region into western half and eastern half, making Tonegawa river which formerly flow at the line of current Edogawa river toward Tokyo Bay. 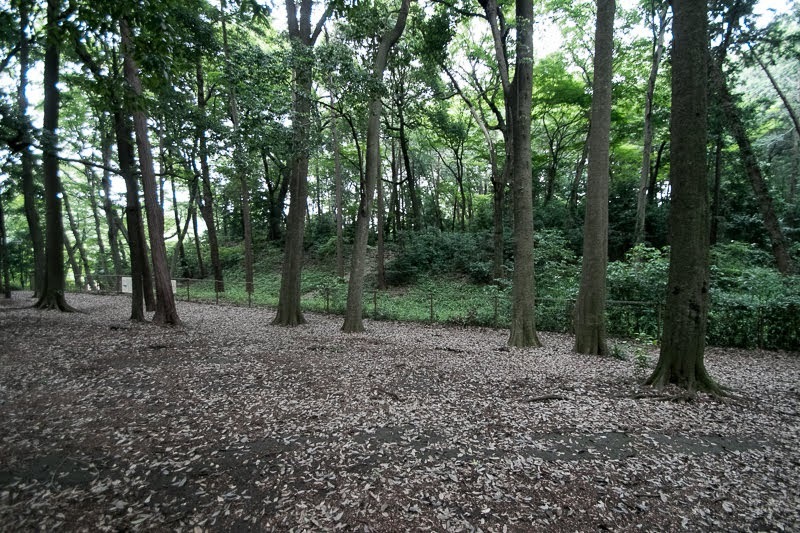 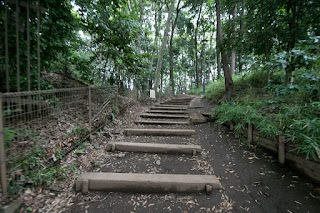 Kamakura Kubo kept western half at Koga castle and renamed to Koga Kubo, and Uesugi clan seized western half. As old Tonegawa river becomes the border against Koga Kubo, under the order of Yamanouchi Uesugi clan, Ogigayatsu Uesugi clan let Dokan Ota to build Kawagoe castle (Saitama prefecture), Iwatsuki castle (Saitama prefecture) and Edo castle (Tokyo Metropolis) along with old Arakawa river, which flows parallel with old Tonegawa river at the east edge of Omiya plateau and built a defense line toward east. The situation of Kanto region was once settled but in 1475, Kageharu Nagao (1443-1514), an important retainer of Yamanouchi Uesugi clan but could not took the position of chancellor, raised his army supported by Koga Kubo, utilizing the situation where both of Yamanouchi and Ogigayatsu Uesugi army gathered at Ikakko area in the north part of current Saitama prefecture to confront with Koga Kubo army. As Kageharu Nagao was distant relative of Dokan, Kageharu invited Dokan to join his revolt. But Dokan refused it thus it became the crush of two talented generals throughout western half of Kanto region. 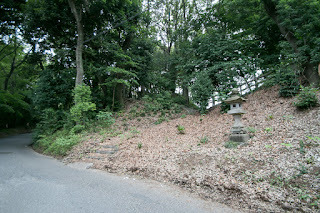 Kageharu instigated local lords of Sagami province (Kanagawa prefecture) and Musashi province at the backside of Uesugi territories. 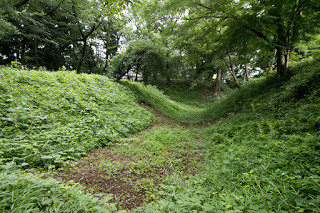 To confront with Kageharu, Dokan tried to keep the triangle of Kawagoe castle, Iwatsuki castle and Edo castle, to securely hold Omiya plateau as cradle. 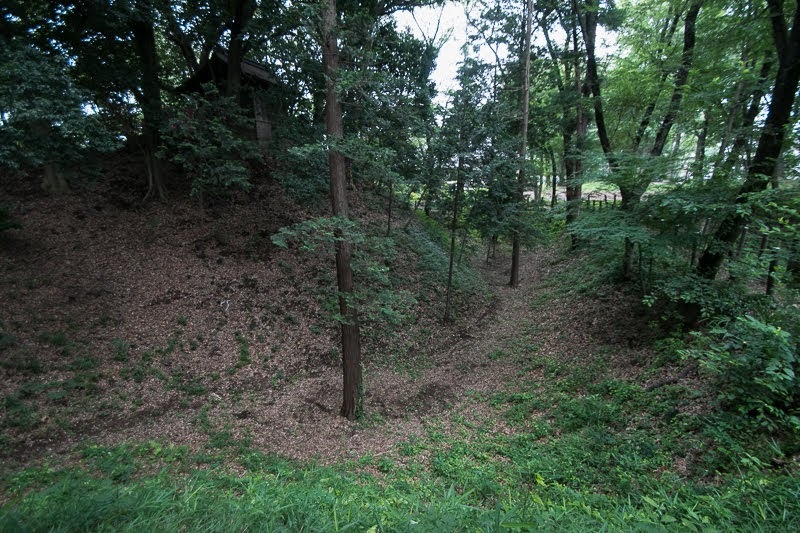 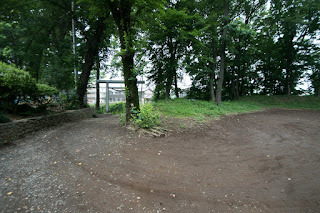 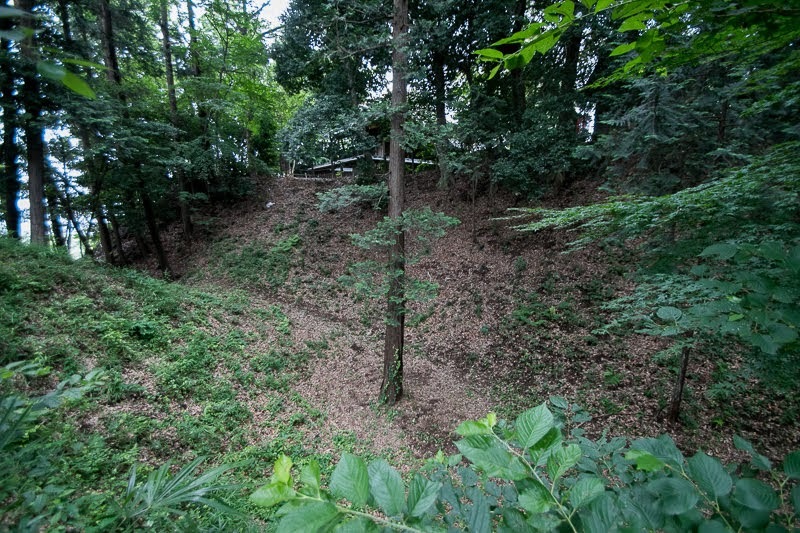 The site of Takinojo castle was at the middle of north and southward direct route between Kawagoe castle and Edo castle, and Dokan had to hold this area to make connection of two castles. 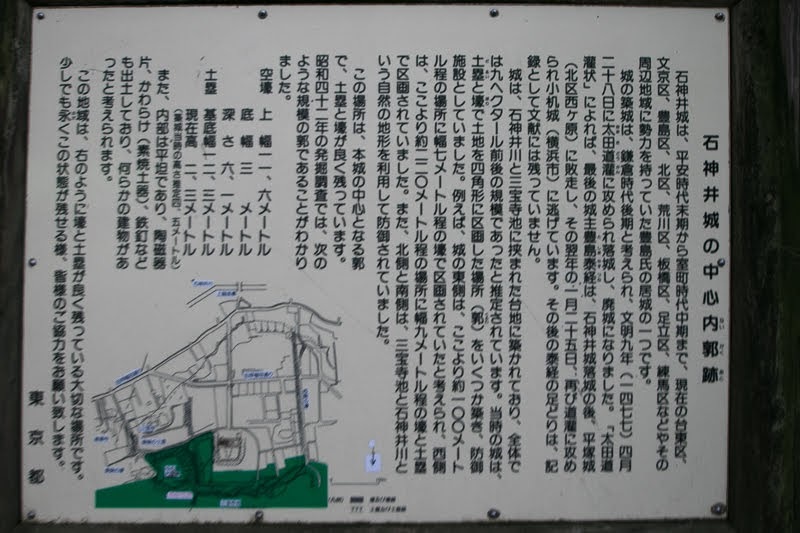 In response to this, Kageharu let Toshima clan at Shakujii castle and Nerima castle to raise against Dokan, to shut the connection of Edo castle and Kawagoe castle. 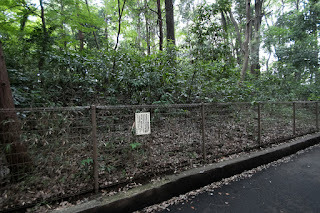 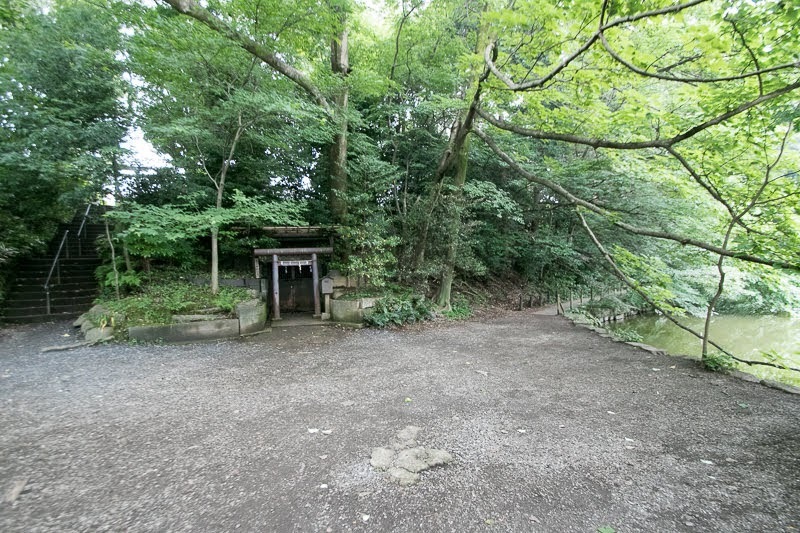 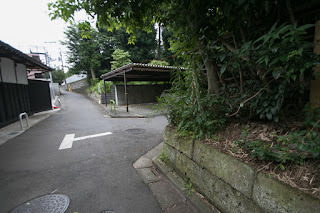 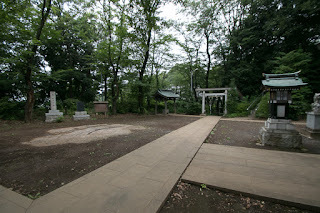 But Dokan provoked Toshima clan to field battle and perfectly broke it at the battle of Egota, then fell Shakujii castle and Nerima castle then recovered the connection. As a result, Dokan could firmly secure the triangle of Edo castle, Kawagoe castle and Iwatsuki castle, utilizing Takinojo castle. Dokan broke the supporters of Kageharu at various places, and also let Uesugi clan and Koga clan make peace. Kageharu who lost their lords and supporter finally lost the battle and left his territory in 1480. 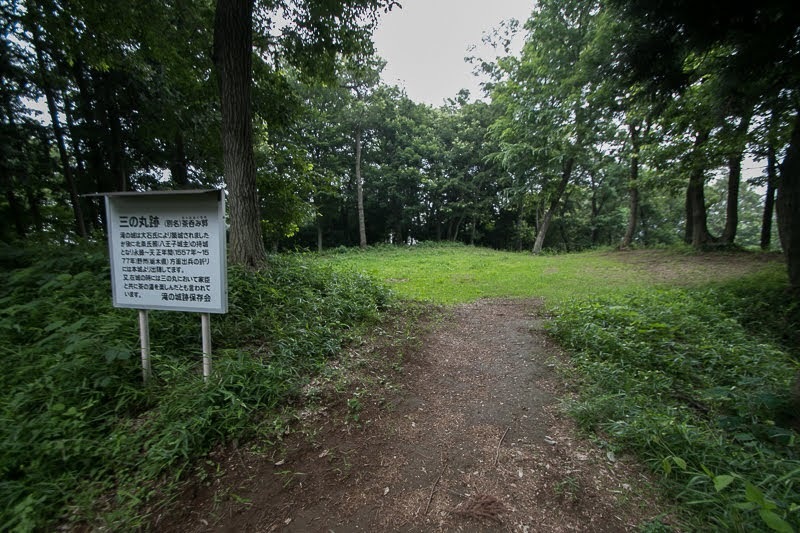 Throughout this battle Dokan increased his fame and territory, but this brought the fear of his master Ogigayatsu Uesugi clan against Dokan. 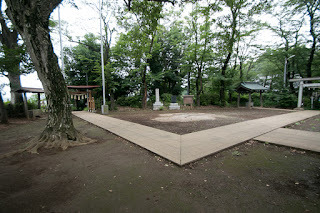 Under the plot of Yamanouchi Uesugi clan to weaken the power of Ogigayatsu Uesugi clan, Dokan was finally assassinated by Ogigayatsu Uesugi clan in 1487. 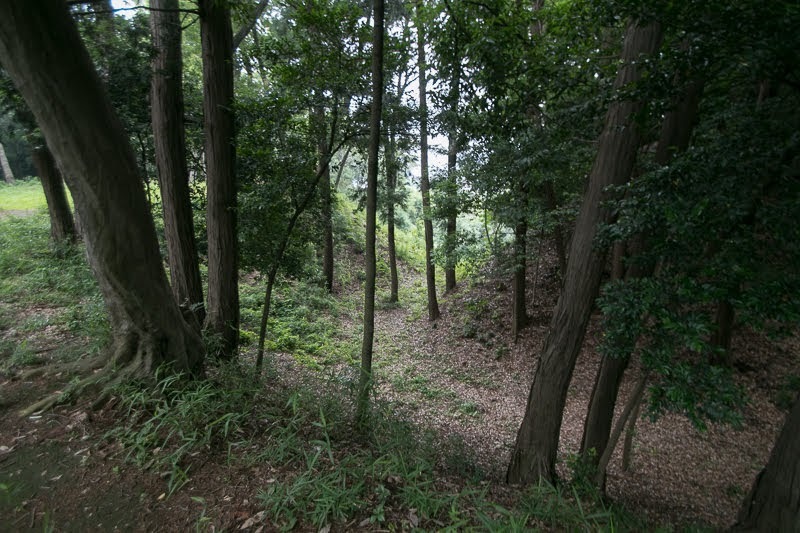 After the death of Dokan, Yamanouchi Uesugi clan and Ogigayatsu Uesugi clan fell into severe internal conflict. 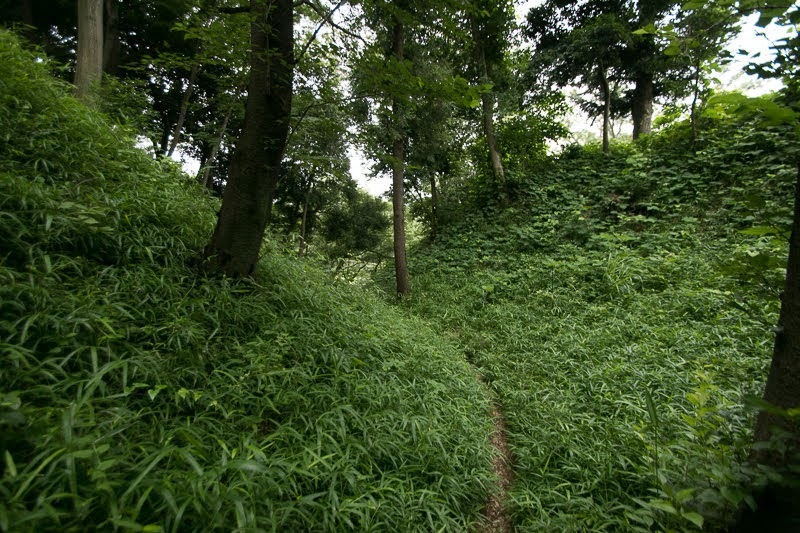 Although Ogigayatsu Uesugi clan was inferior to Yamanouchi Uesugi clan but it was supported by Kageharu Nagao who returned to the battlefield, and Yamanouchi Uesugi clan lost its leader at intervention to their territory Echigo Province (Niigata prefecture). 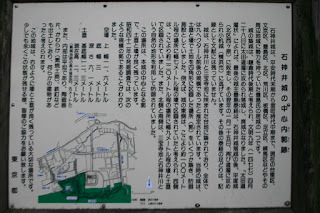 Among the battered situation of two clans, Hojo clan which captured Izu province (Izu peninsula) in 1493 and also seized Odawara castle (Kanagawa prefecture) in 1495 gradually grew their power. 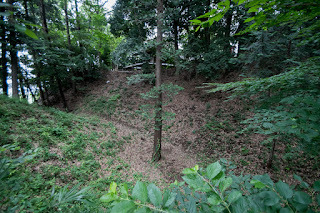 Facing the rise of Hojo clan, Ogigayatsu Uesugi clan and Yamanouchi Uesugi clan allied but it was too late, and they lost the main part of Kanto region by the defeat at the night battle of Kawagoe castle in 1546. 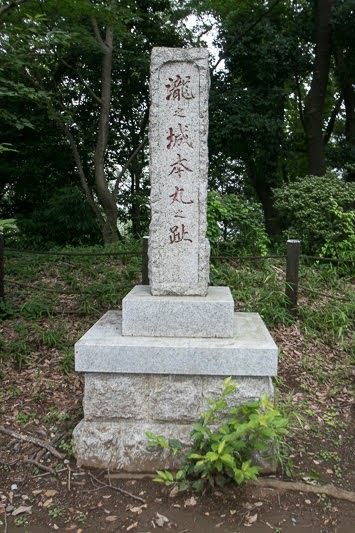 At the period of fourth leader Ujimasa Hojo (1538-1590), most part of Musashi province was managed by his younger brother Ujiteru Hojo (1540-1590), the commander of Takiyama castle (Tokyo metropolis). 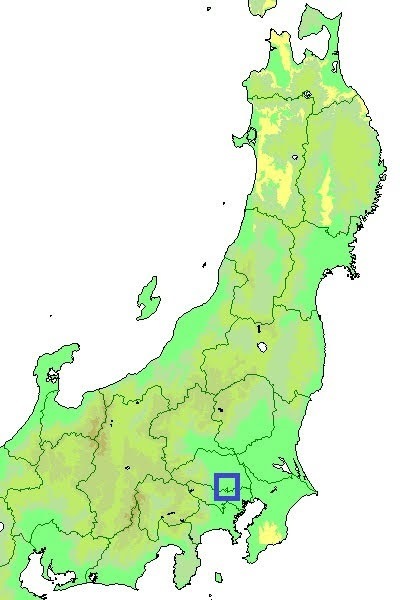 Hojo clan continued to expand toward east half of Kanto region, and Ujiteru lead military operations of Hojo clan at Kanto region instead of Ujimasa Hojo. 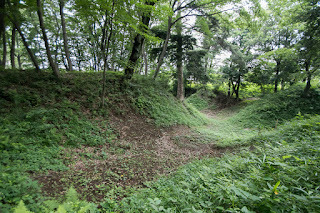 Along with the expansion of his territory, Ujiteru placed his front base at Kurihashi castle (Saitama prefecture), an important place where large rivers of Kanto region such as old Tonegewa river, Watarase-gawa river of Kinu-gawa river met. Kurihashi area is geographically at the center of Kanto region, and Takiyama castle that is the main base of Ujiteru locates at the southwest of the plain. As a direct route of east and westward between Takiyama castle and Kurihashi castle, Ujiteru used the road passes Takinojo castle and Iwatsuki castle, which is currently separated into various roads. 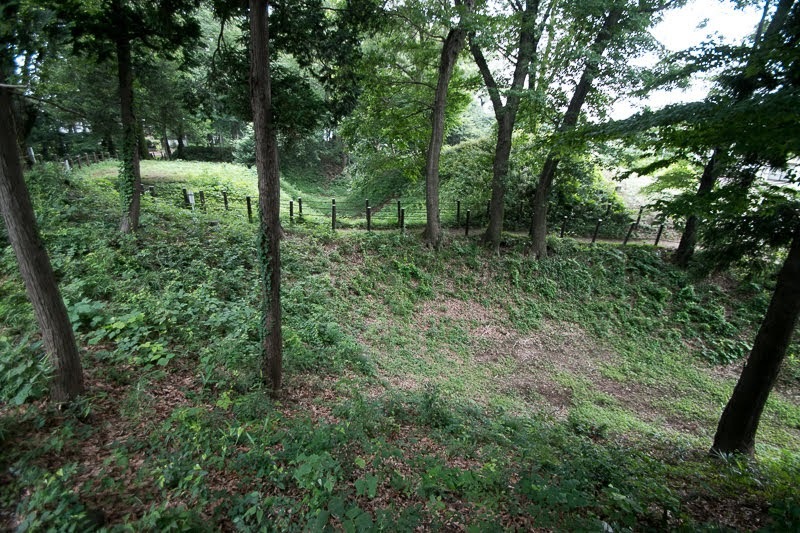 Ujiteru expanded Takinojo castle as an important branch castle which can hold soldiers and supplies, and visited on the way to Kurihashi castle on the way to the front. 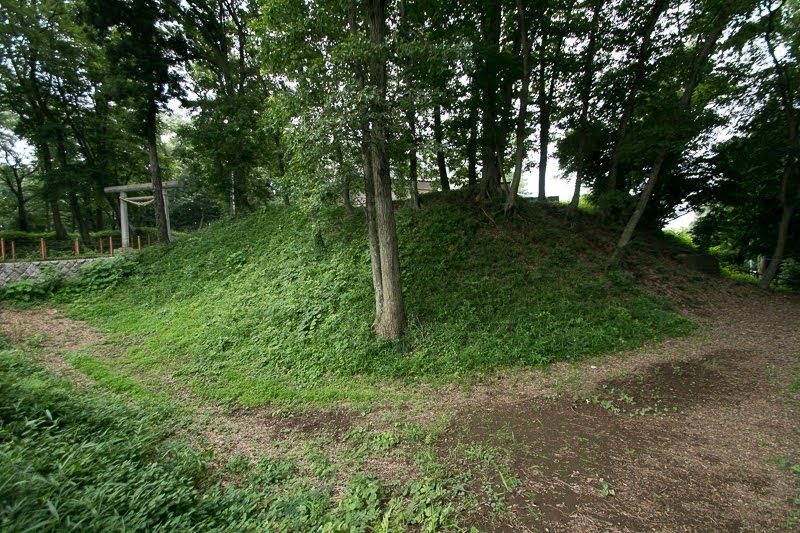 As a only possible plan for castles built at the edge of flat plateau, Takinojo castle has a concentric circle structure same as Suwahara castle (Shizuoka prefecture) built by Takeda clan. 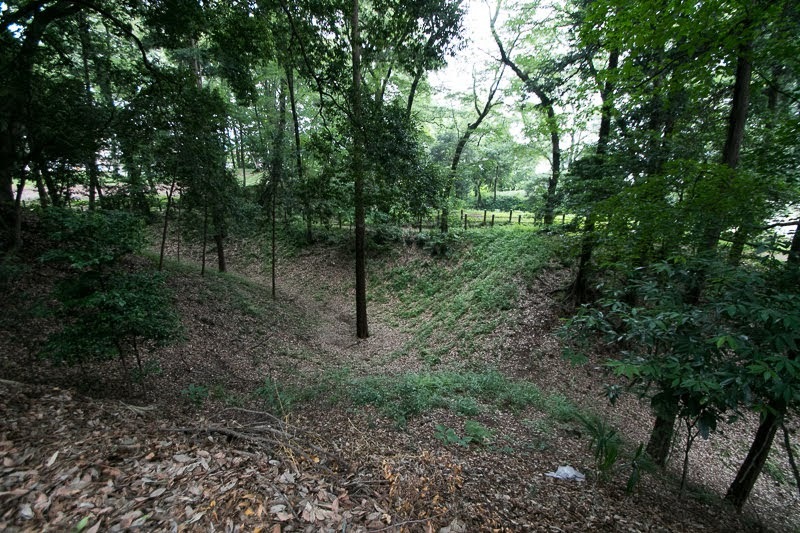 Central area is a roughly square area of 50 meter long used as a ground of shrine, which has a large clay wall at northwestern edge which might be a basement of main building. 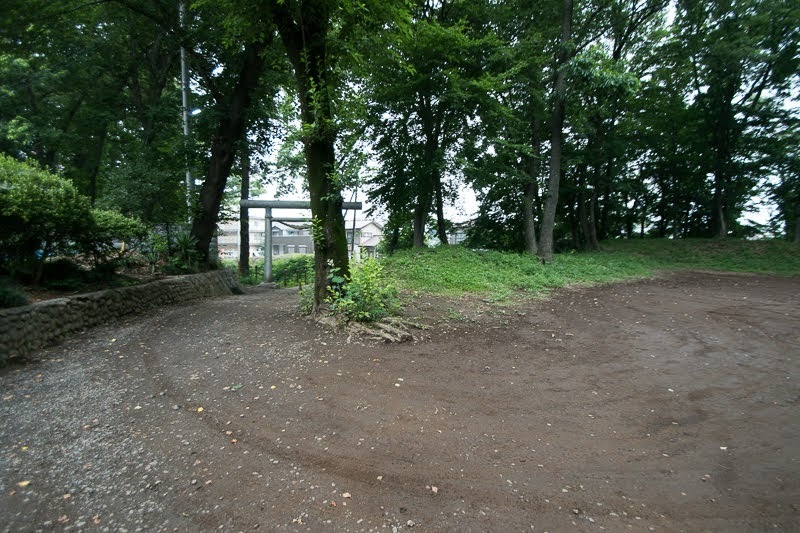 Aside of this clay wall, the ruin of four pillar gate was excavated. 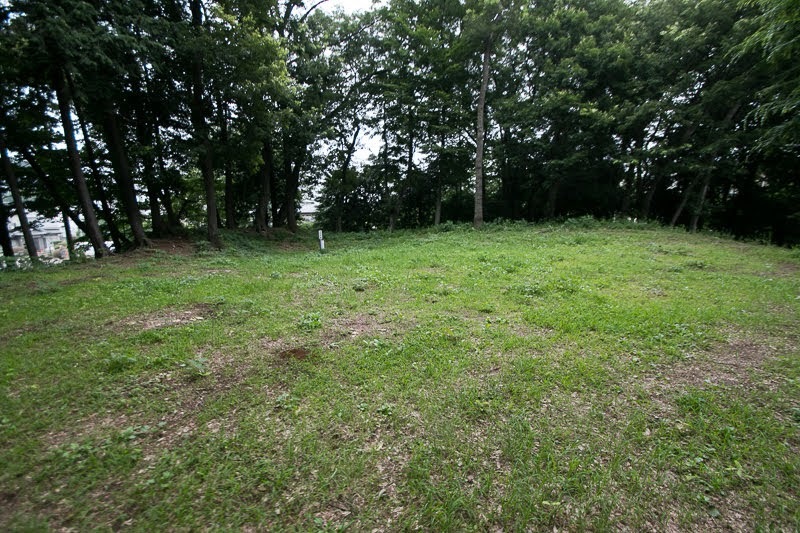 Secondary area and third area encircles the front line of central area. 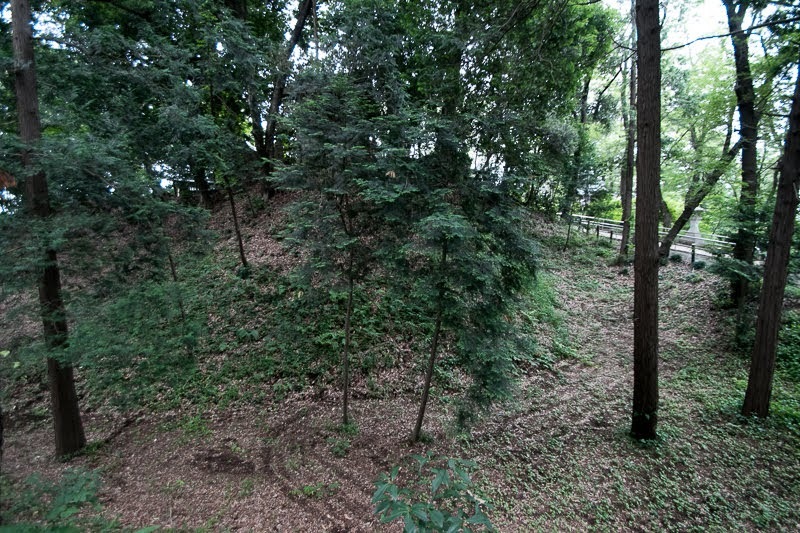 Secondary area is a L shaped one of about 80 meter long and 40 meter wide, which is surrounded by clay wall and dry moat. 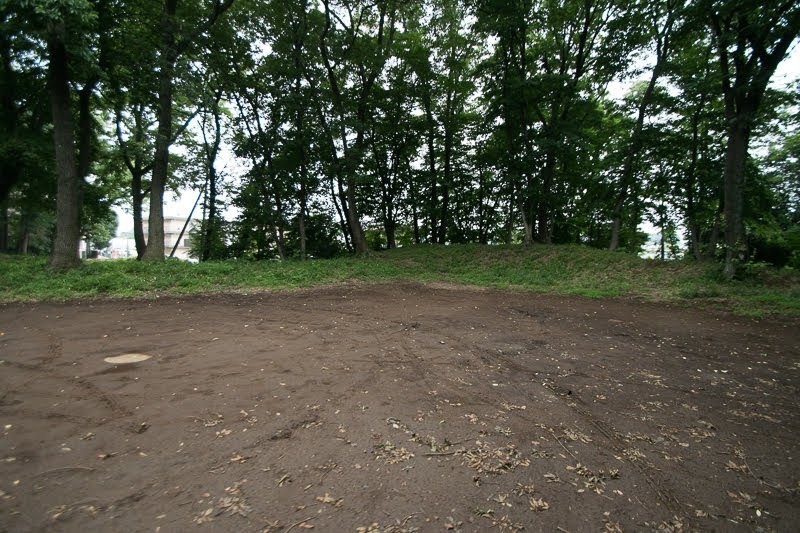 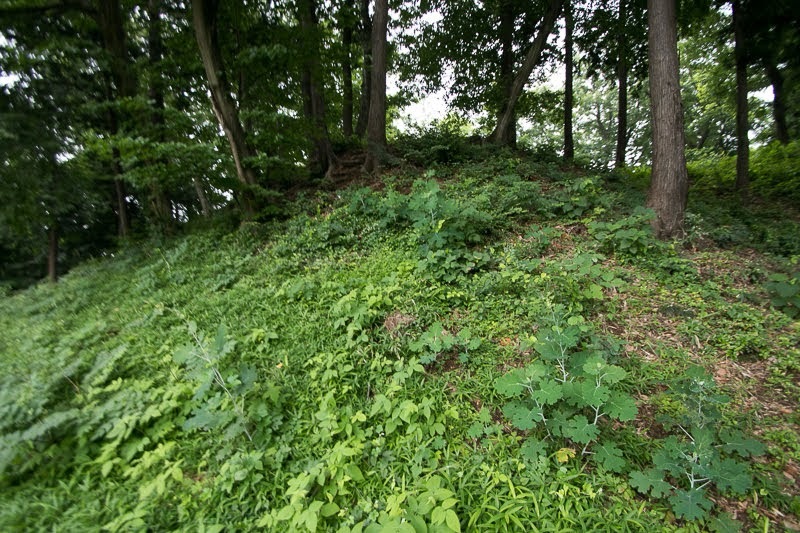 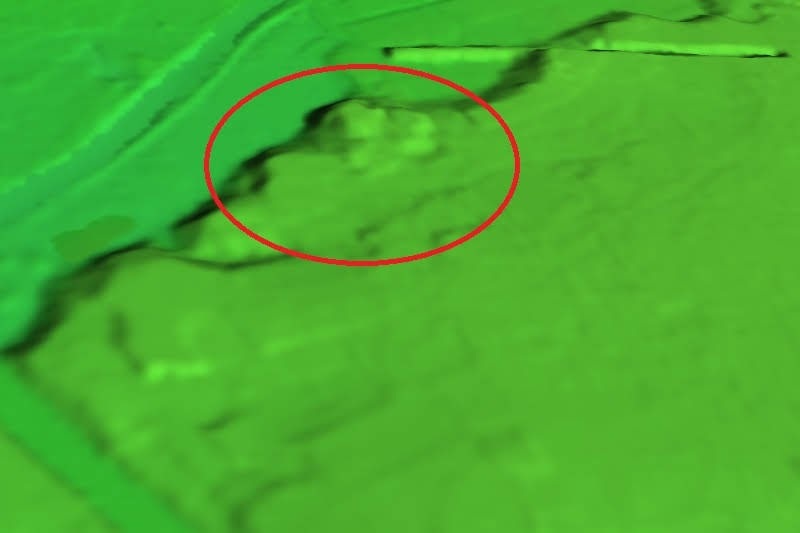 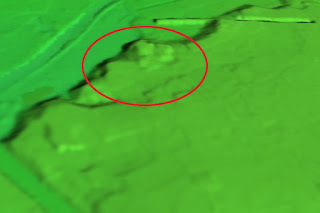 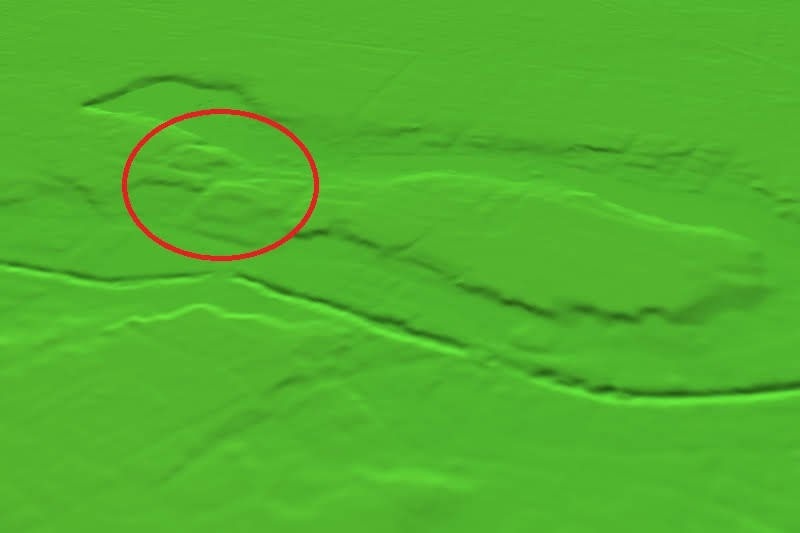 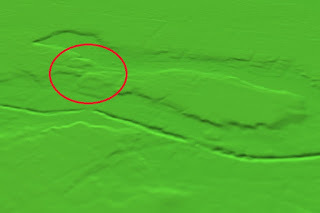 Third area is a 30 mater square shaped one at the northeast of central area, which also has a clay wall and dry moat along with the ruin of the well. Core part of the castle is not so large but securely protected by folded line of clay walls and deep dry moats. Outer area spreads northeastward from central area, which might be a large one of about 300 meter long and 200 meter wide. 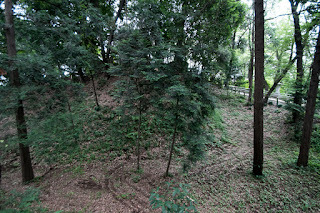 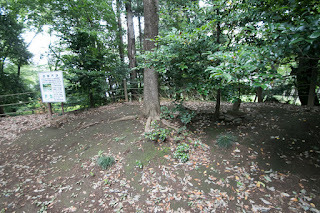 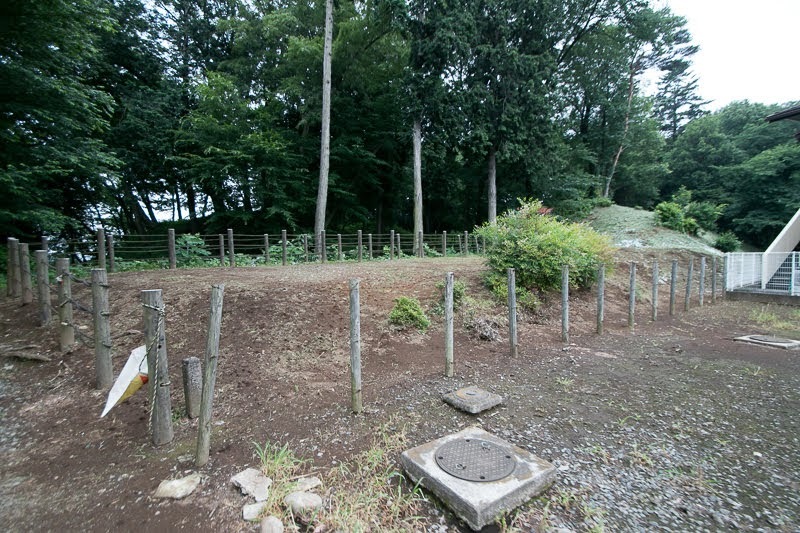 Ruin of outer barrier and moat slightly remains or excavated, which has the dry moat separated into small compartment seen in the last period castles of Hojo clan such as Yamanaka castle or Iwatsuki castle. 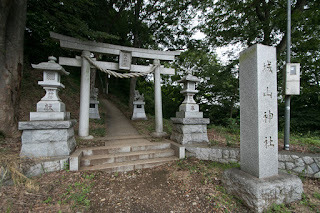 Hojo clan steadily expanded their territory under the order of Ujiteru Hojo and was close to the unification of Kanto region by the end of 1580’s. 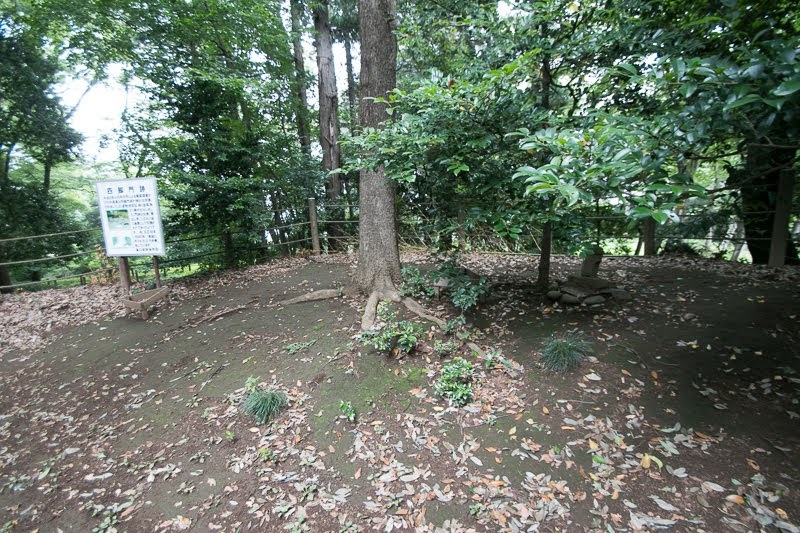 However, Hojo clan broke with central ruler Hideyoshi Toyotomi (1537-1598) in 1590 and faced Odawara campaign by Toyotomi army. As Ujiteru Hojo was hardliner against Toyotomi government, Takinojo castle became the target of attack by Toyotomi army and burnt down in one day. Hachioji castle (Tokyo metropolis), the new main base of Ujiteru Hojo also fell by hard attack of Toyotomi army in one day, and Ujiteru was forced to suicide along with Ujimasa Hojo after the open of Odawara castle, the main base of Hojo clan. 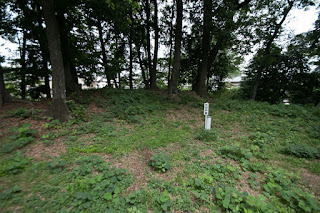 Now all building was lost and outer part of the castle was destructed by the development. 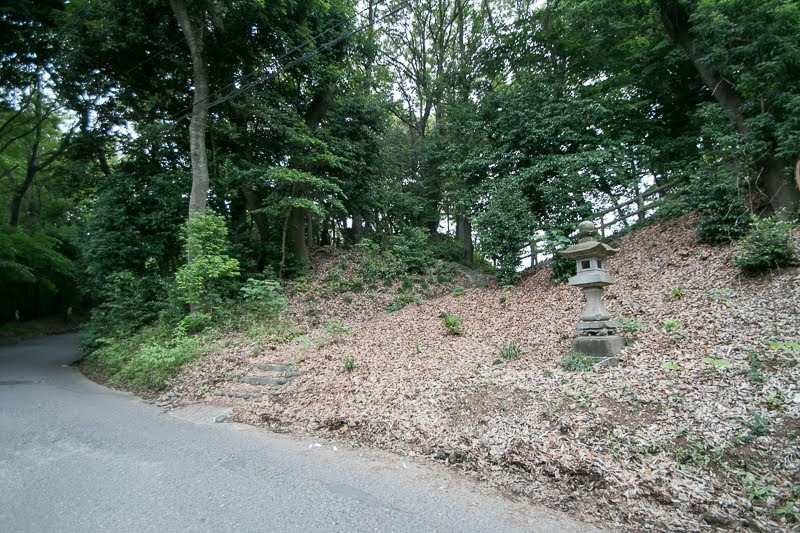 But core part of the castle miraculously keeps its original style, being helped by its limited size, early time nomination as a historical site and usage as a ground of shrine. 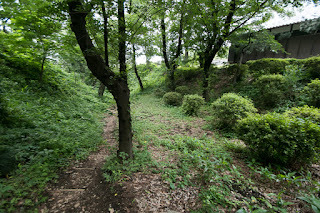 Good access to the castle shows unchanged importance of castle site, and it is nothing but a miracle such a well preserved ruin remains just 1 kilometer away from station of major railway line. 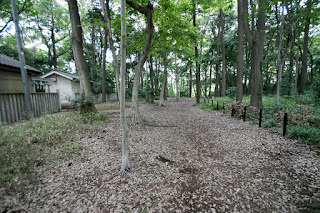 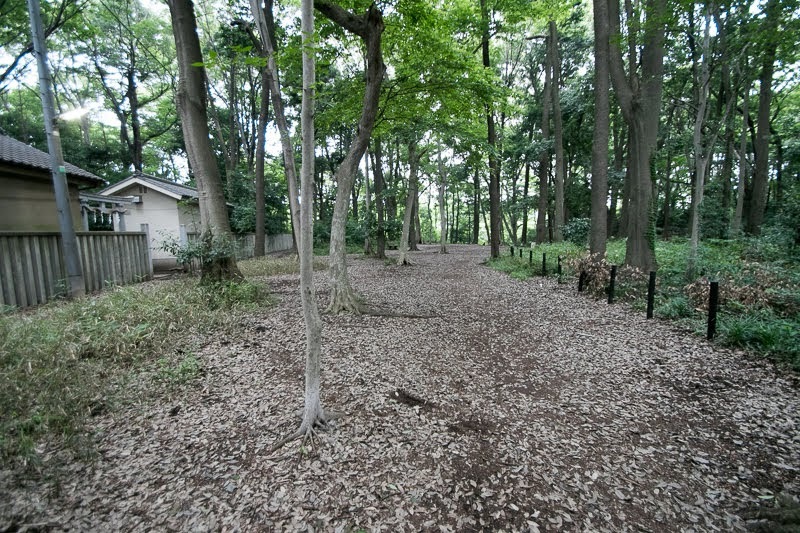 15 minutes walk from JR East Musashino-sen line Higashi-Tokorozawa station. 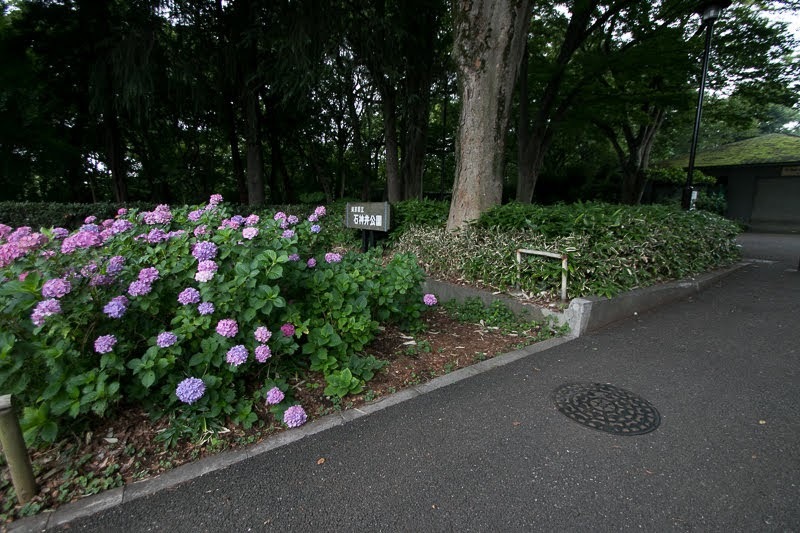 10 minutes drive from Kanetsu Jidoshado Expressway Tokorozawa interchange.